Replies: 239 (Who? ), Viewed: 23795 times. EDIT: I have begun to re-insert the pictures. Since I lost all my originals it will not be a quick process as i have to re-create the entire game and re-take all the pictures, but I am looking forward to getting back to it! There is so much left to tell! If you are not a new reader, I hope you'll forgive some changes; some of the events in the original story were just based on random things that happened as I played. If those things don't happen the same way, I'll have to go in different directions. There are also a few things I plan to change because I think they might work better than the way I'd done it in the past version. Hope you enjoy the old and the new! 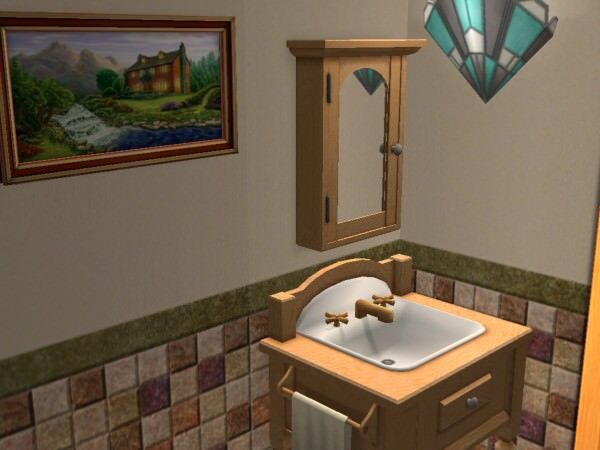 I love Pleasantview and have played it many times. One day some years ago I decided to write a story about the people who lived there but I never posted it because I created it before I had good picture-managing skills. 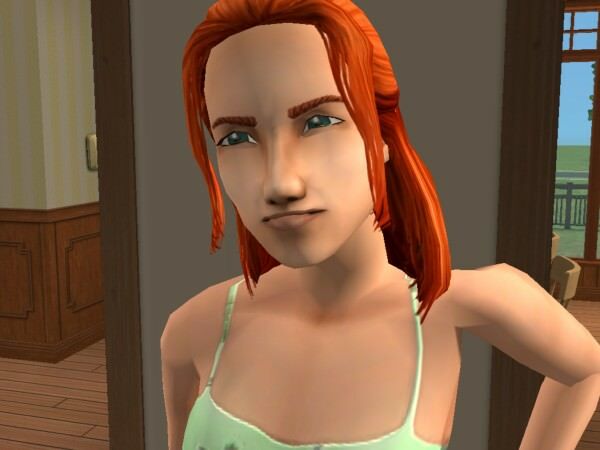 I got so caught up in the story while I was playing it in the Sims world that I took thousands of pictures without moving them to sub-folders, so trying to sort them into chapters after the fact was a nightmare and I gave up pretty quickly. But the story has stayed with me so I finally decided I had to get back to it. The inspiration for this story was the beginning scene in the Pleasant household where I noticed that although Lilith was "the bad one," it was actually Angela who initiated the slapping fight. That got me thinking, and my story eventually expanded to include many of the beloved inhabitants of Pleasantview, their romances, dreams, and tragedies. And there is something odd going on in this neighborhood--you'll have to watch for the clues! 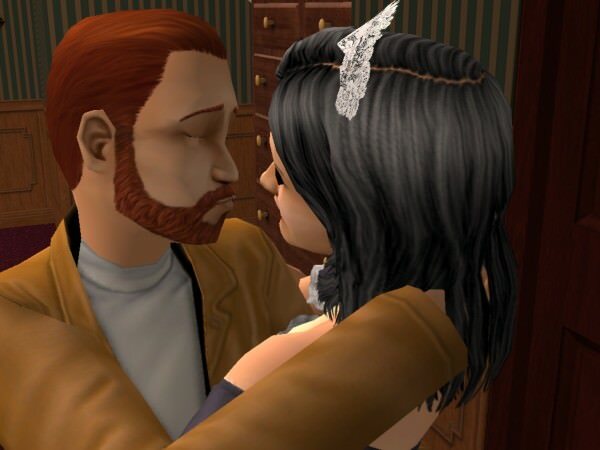 The story is mostly a soap-opera style drama but I have also tried to be funny, especially with the silly little things that our Sims are wont to do. It will be familiar but also engaging, I hope! So on to. . . In the little town called Pleasantview things seemed quiet and peaceful, but that was only on the surface. Under the rain that was gently falling, in the house occupied by the Pleasant family, dramas were about to unfold. 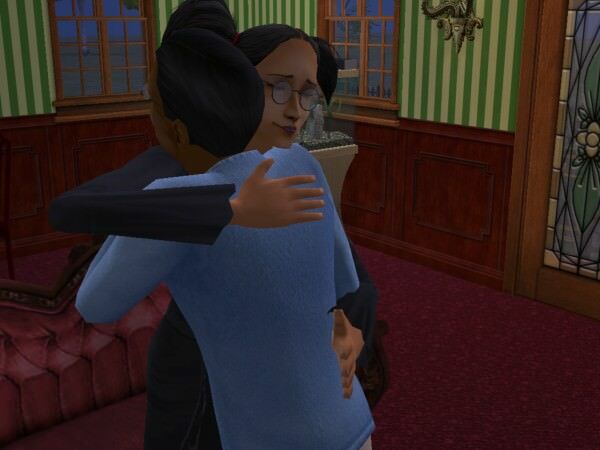 Angela Pleasant was â€œevery parent's dream.â€� She was an excellent student, didn't get into trouble in public, and dressed like a proper little lady. The reality though, was that she wasn't as sweet on the inside as she appeared on the outside. That morning, like most others, Angela went to torment her twin, Lilith. She couldn't really explain why she hated her so much. Perhaps she was jealous of Lilith's brains. To get good grades, Angela had to study constantly. Lilith could easily get straight A's if she wanted to. Though she didn't seem to want to. Angela gave her a good smack, just because she felt like it. And she knew from past experience that Lilith wouldn't fight back. Lilith was startled, but not really surprised. She knew Angela hated her, but she wasn't really sure why. It's true they were very different--Angela seemed to always want to please people while Lilith was so busy she always wanted to Go! And Do Things! Even as a toddler, Lilith had been too busy and active to cooperate with any skills her mother tried to teach her. But she'd never hated Angela until it became clear that Angela hated HER. Lilith couldn't help herself. The frustration she felt burst forth in angry tears. She was embarrassed to cry in front of Angela, but her emotions couldn't be contained. She knew that, as always, Angela would convince her mother that Lilith instigated the fights--only Lilith knew the truth. Angela watched her dispassionately for a moment, then turned to board the school bus. 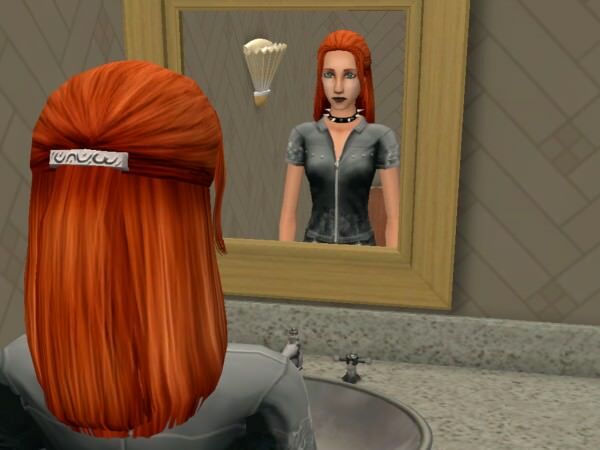 Lilith went into the bathroom to fix her face, and gazed at herself in the mirror. "I look pretty good. The only problem is I look too much like Angela! I swear, some people can barely tell us apart!" She was utterly sick and tired of looking like Miss Goody-Two-Shoes. "Well," she thought to herself, "that changes TODAY!" 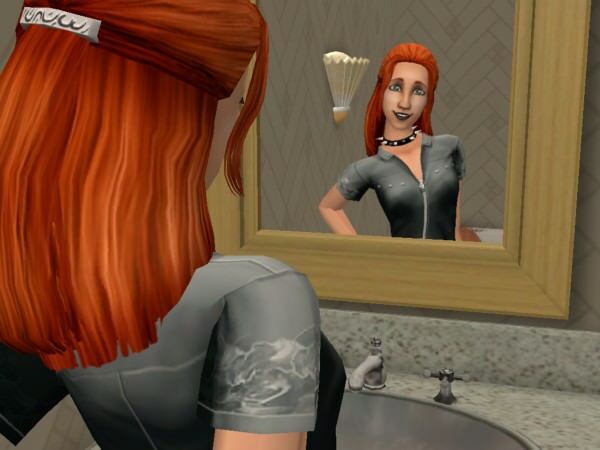 Lilith decided a whole new look would, if not change her life, at least set her apart from her twin. 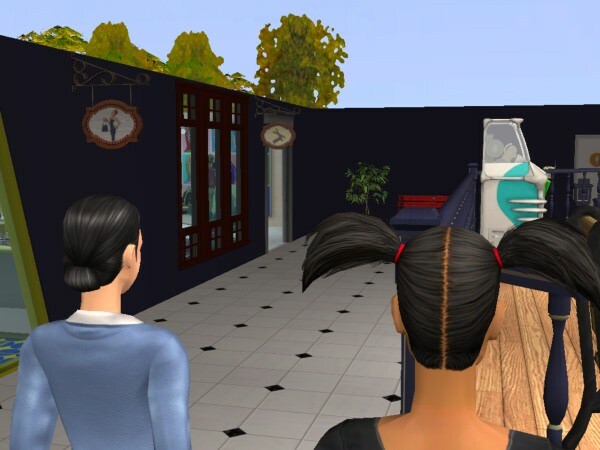 Luckily, in Pleasantview you could just look in the mirror and WISH for a new look and it would happen! Her new style made her laugh. Well, it was certainly a change! Lilith followed her twin onto the school bus and chuckled at Angela's shocked reaction. The mother of these very different twins was Mary-Sue Pleasant. She sat on the couch quietly while waiting for her ride to work and thought about her situation. She was getting older and her husband Daniel had been ignoring her for years. He'd been having affairs all over town and she was sick of it. Lately he'd been eyeing their maid, Kaylynn Langerak, but Mary-Sue had taken care of that problem by calling the cleaning agency and canceling the service. She sighed. Her marriage was over in all but name, but maybe she could hang on a bit longer, at least until the girls were off to college. Mary-Sue's ride arrived, and she climbed into the beat-up car while Lilith and Angela headed off to school. 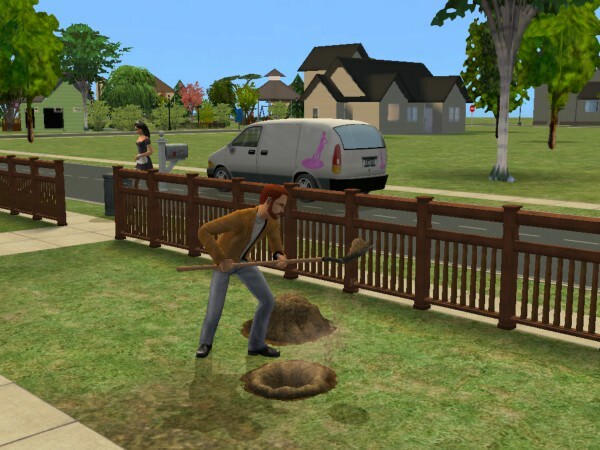 Daniel ignored them all, as he was busy digging a hole in the front yard. He did that a lot. Daniel waited until the school bus and his wife's carpool had pulled away, then ran into the house to call the cleaning service. 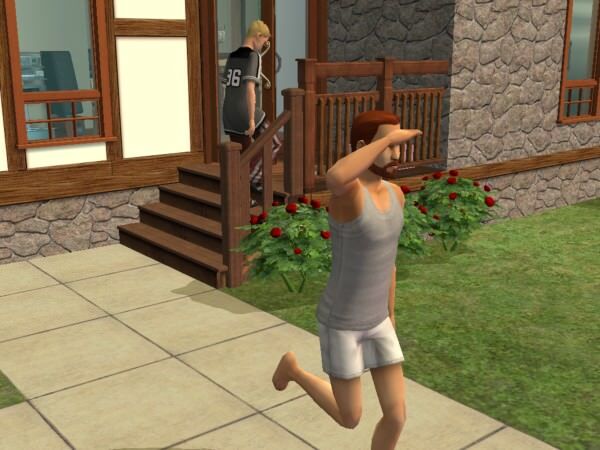 "Could Kaylynn come over right away? My wife accidentally canceled the maid but our house sure needs service," he lied to the receptionist. The receptionist assured him they'd send Kaylynn over quickly, then hung up. Daniel laughed to himself. "It might be more accurate to say the bedroom needs service." Kaylynn was Daniel's latest target for his romantic exploits; the young and beautiful maid had caught his eye from the moment she had walked into the house and begun to clean random items in no discernible order that made sense. She'd been resistant to his advances so far, but he was confident he could charm her into his heart, and his bed. The thought of another conquest made him so happy! 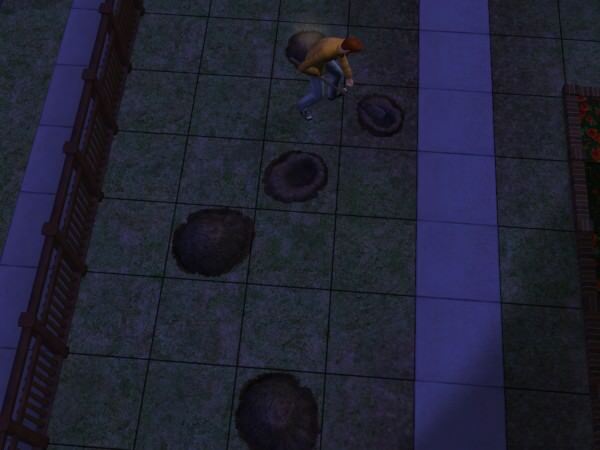 Daniel went outside to continue digging his hole while he waited for Kaylynn to arrive. When she drove up in her van, he pretended he hadn't noticed her and continued digging. 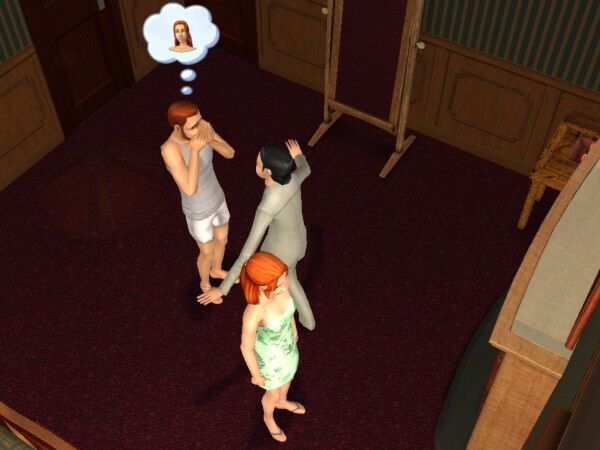 He watched her through the window though, and when he saw her head for the bedroom, he ran in after her. His sudden appearance made her jump. "Oh, Hello Mr. Pleasant! I didn't hear you come in!" she said in a startled tone. He replied, in his most charming, silky voice, "Now dear, didn't I tell you to call me Daniel? I want us to be good friends!" He went on with a little hitch in his voice as he drooped his shoulders dramatically, "I think. . . you're my ONLY friend. My daughters think I'm a hopeless square, and my wife is only interested in money. She won't even . . . kiss me anymore. It seems like you are the only one who understands me." He smiled at her shyly, and reached out to caress her cheek. Kaylynn accepted his touch, but was hesitant. She'd been working for the Pleasants for a few weeks, and from the very first day Daniel had talked to her in a friendly way and told her the sad stories about his wife. At first she thought he was just looking for a friend, but as time went on it became clear he was interested in more than just friendship. 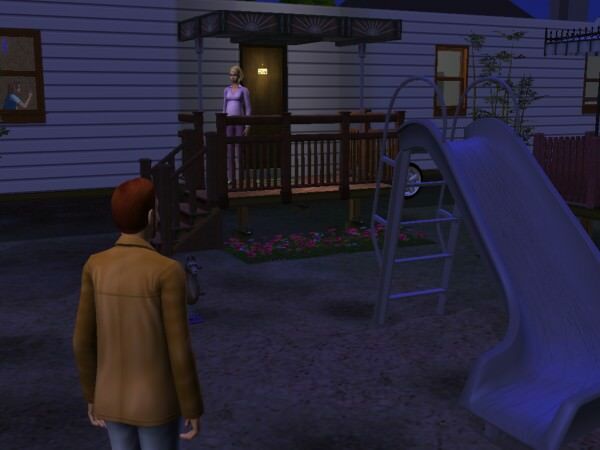 As wrong as she felt it was to have an affair with a married man, she was also very lonely in Pleasantview. 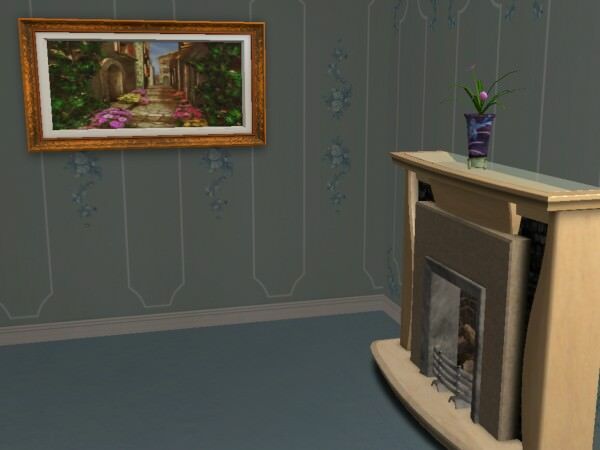 She'd only moved there a month ago, and her boyfriend Don Lothario had recently seemed very distant and aloof. Her attempts to make other friends in her new town had been unsuccessful. Daniel was watching Kaylynn carefully as she pondered. He was expert at manipulation and knew how to tug on a young woman's emotions. He saw the sadness in her eyes and knew that she was feeling sorry for herself, but also for him. He judged the moment was right and pulled her into his arms and began to kiss her. She didn't resist. He had timed it just right. Daniel lured Kaylynn onto the bed by telling her that he felt sad and lonely and wanted to cuddle. Once he got her on the bed, he seduced her with his tale of once being an up-and-coming skiing star--but explained that Mary-Sue hadn't supported his dream and had made him give up his skis and find a boring and unfulfilling job. Kaylynn couldn't quite believe her ears, and she wasn't sure this was a good idea, but Daniel was almost the only person to be nice to her since she had moved to Pleasantview a month ago. She felt sorry for him because she knew his wife and daughters were mean to him. He had told her this. And she knew what it was like to have your dreams snatched away. His charm worked. 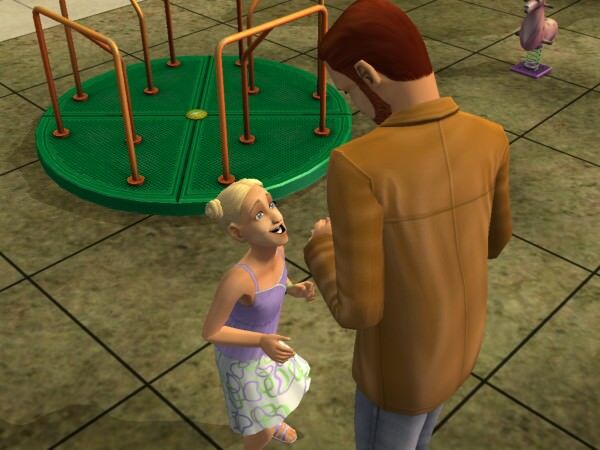 Kaylynn had been so lonely in her new town, and this man seemed to sincerely like her . . . she took the leap. 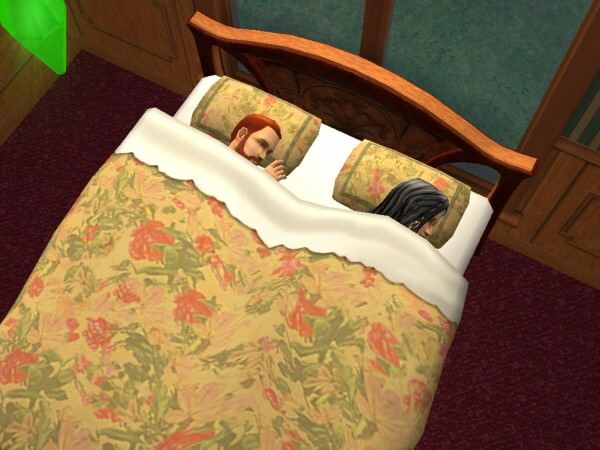 As she snuggled next to him, she dreamed of what a great life they could have together once he left his wife. He had told her that was his plan after his daughters went off to college. 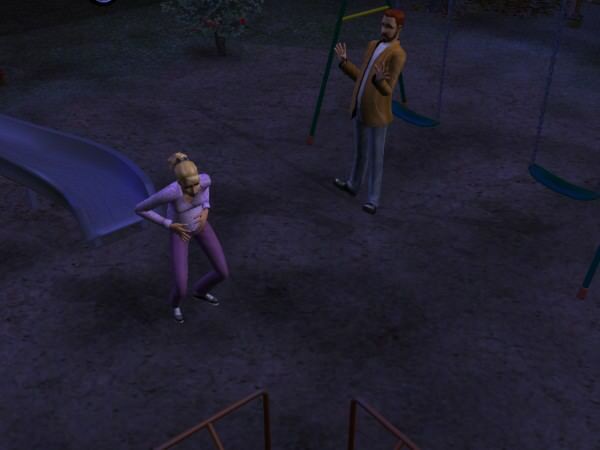 After the WooHoo, which was over very quickly, and with a distinct lack of fireworks, Daniel tried to wake Kaylynn quickly to send her away. She snored deeply though, so he decided it would be okay to let her sleep a bit. He knew the twins wouldn't get home for a few hours and Mary-Sue would be at work until three o'clock, so he had a little time. He'd get Kaylynn out of the house long before they got home. He was sure NOTHING could possibly go wrong! Last edited by grumpy_otter : 21st Nov 2018 at 3:36 PM. 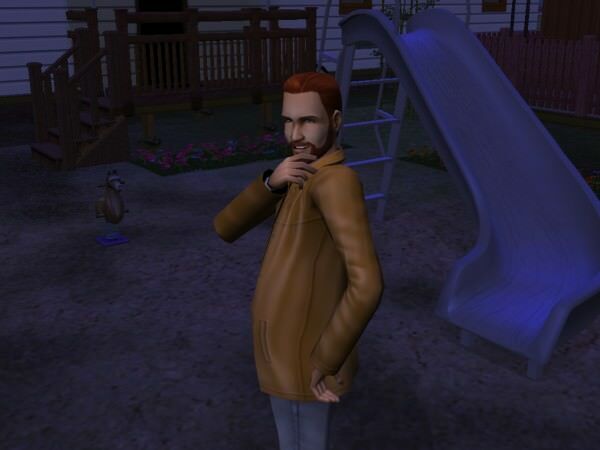 I May Be Life Dumb But I'm Sim Smart(mostly). At work that morning, political intern Mary-Sue was finding it hard to get started on her task of going through a tedious stack of campaign-related paperwork. She didn't like her job, but she had little choice but to keep it as Daniel's grandiose career plans never seemed to pan out. 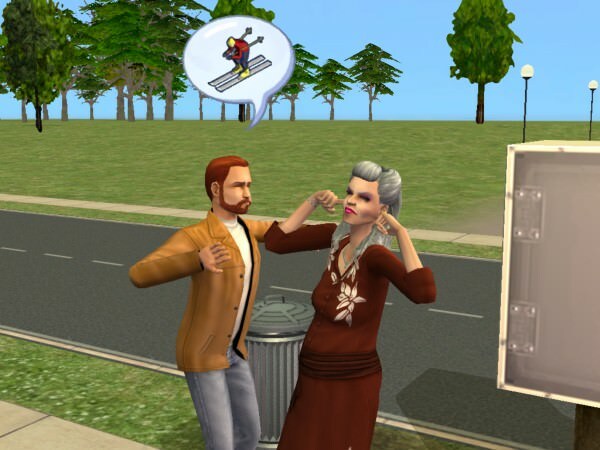 She remembered when they'd first been married and he thought he could be a professional skier. Never mind that he was appallingly bad at it and never mastered even the most basic moves on the slopes; he'd take time off from work to ski and buy expensive gear, telling her that his failure was because he needed the best skis and poles and outfits in order to be successful. And somehow he never invited HER along on his ski trips. She suspected his affairs had started long ago, and that "professional skier" was just a ruse so he had an excuse to go away for the weekends. She looked longingly toward the tiny window in her cubicle. She sighed. Mary-Sue had always loved music, but put those dreams on the back burner to work boring jobs to provide for the family, since Daniel wouldn't do it. 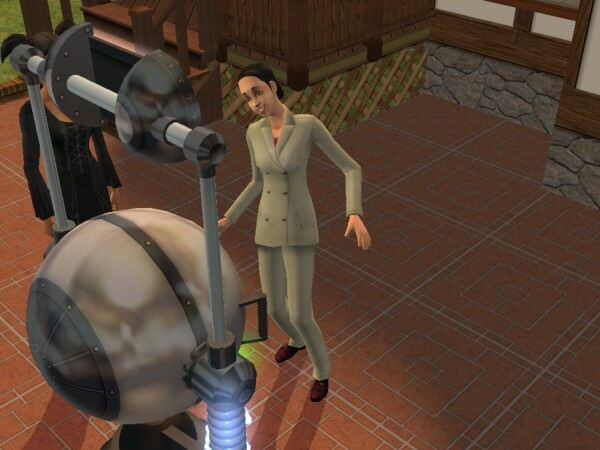 After close to 20 years of marriage, they only had 2000 simoleons saved, and she never seemed to be able to take a break from work. If Daniel hadn't been spending money on his useless skiing toys, not to mention the money he spent on his affairs, she thought they'd be in better shape. 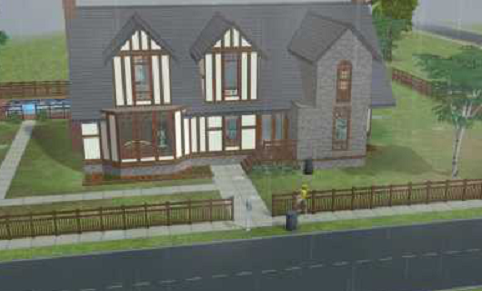 Well, at least the house was paid for! She turned her attention back to her work. 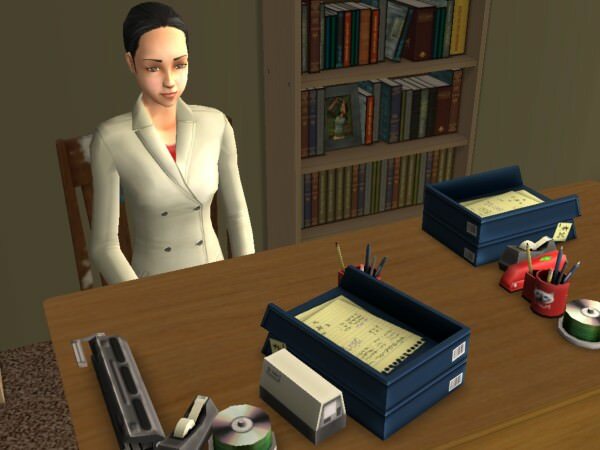 To her horror, she realized she'd started editing the documents she'd been given, not sorting them. Maybe her boss wouldn't mind? 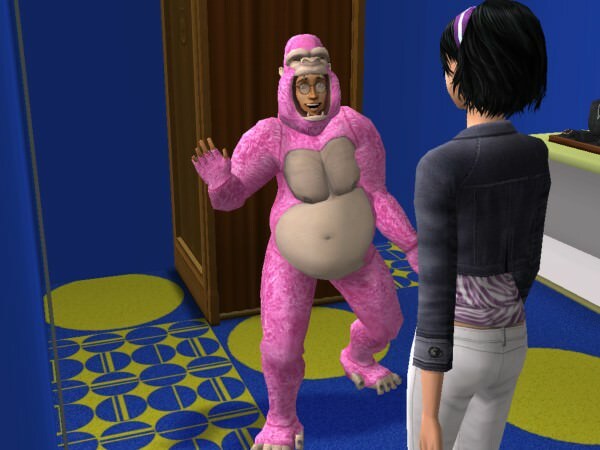 Suddenly he walked in the door. Mary-Sue smiled nervously. Mary-Sue tried to make a joke. "I've been coming in early . . . Any chance I'm about to be promoted?" She quipped. 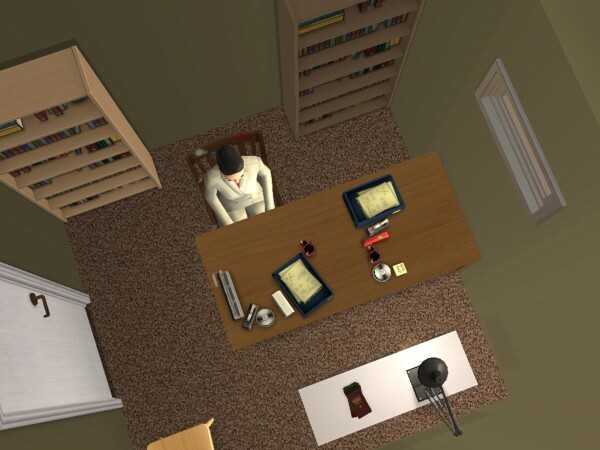 As he left, Mary-Sue stared down at the unfinished work on her deskâ€”the work that she'd started doing incorrectly. The problem was that she didn't really care about political work. And she couldn't deny that her boss was right that she didn't pay attention. 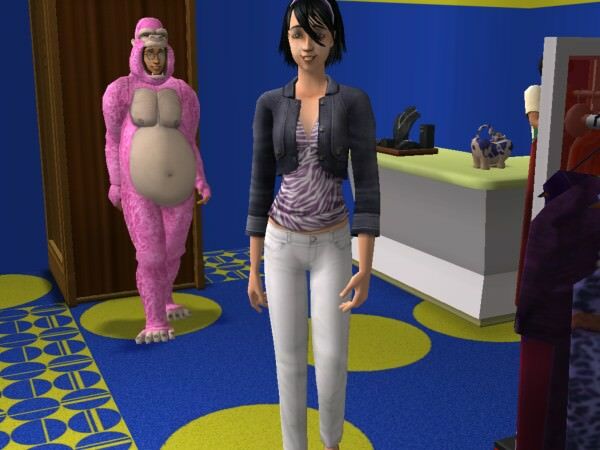 When she got home early, Mary-Sue realized something seemed different. The maid's van was parked in front of her house! She couldn't believe it! 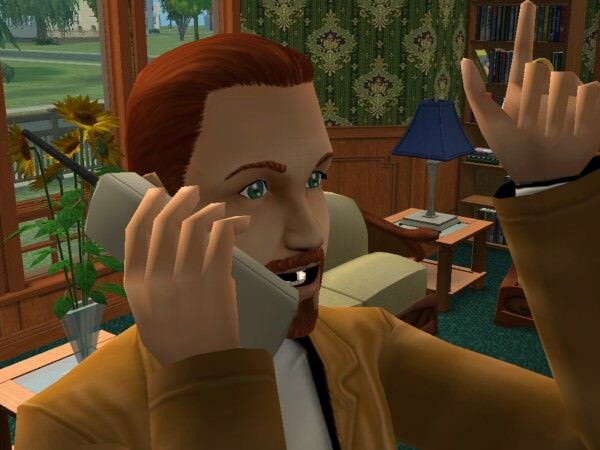 Could Daniel have called Kaylynn over after she'd canceled the maid service? 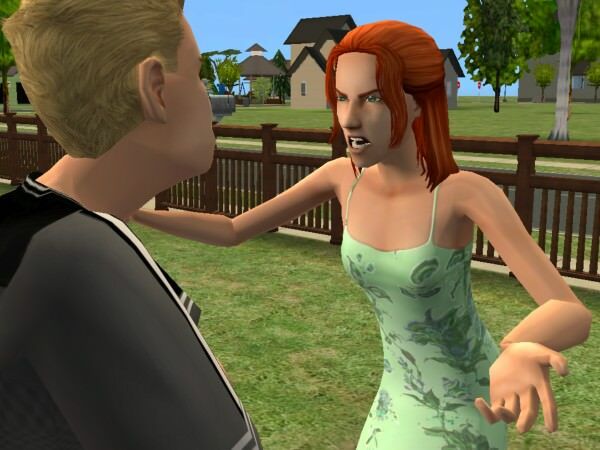 Mary-Sue started up the walk to confront Daniel. Why did this have to happen today of all days? And why was that weird woman standing there staring at her? Mary-Sue headed inside to the bedroom, mentally preparing herself. She looked down at her side of the bed--and was not really surprised to find it occupied by Kaylynn. "Daniel." She spoke calmly, but with ice in her voice. "I can see you didn't expect me home. But I got demoted at work, so here I am! Daniel was thinking quickly--Was there any way out of this mess? He'd better come up with something or he'd be in big trouble! Mary-Sue's voice woke Kaylynn. She was startled and embarrassed, but faced Mary-Sue, ready to try and defend what she'd done, but she was cut off . Mary-Sue turned to her and said "You know, I can't even be mad at you--I know what he's like. He probably told you his wife didn't understand him and his daughters hated him. Did he also tell you he never spent time with his family because he was too busy taking his affairs away every weekend to 'go skiing?'" Mary-Sue gestured with air quotes to indicate how much skiing Daniel actually did on his weekends. Kaylynn quickly threw on her uniform and prepared to leave the house. She was confused--Mary-Sue didn't sound like a mean woman; she sounded like a woman who'd been betrayed. But Daniel had said he loved her--he couldn't have been lying, could he? 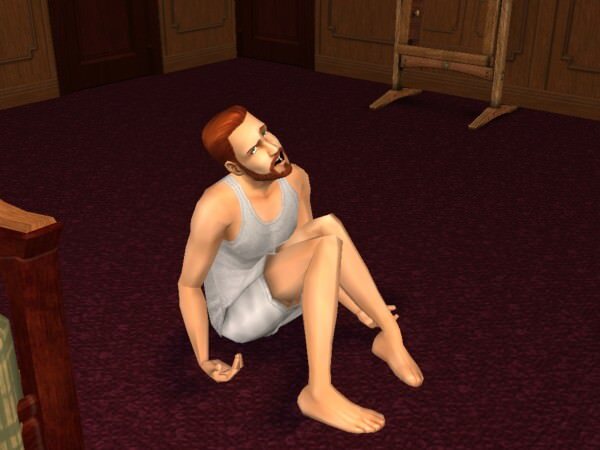 Back in the bedroom, Daniel fell on the floor and pretended to be having a fit. "I wuv you honey, don't weave me! I don't want the maid, I want you!" Mary-Sue was unimpressed. He'd thrown tantrums before to try and distract her. "Stop acting like a baby and get up off the floor!" Mary-Sue said. "This behavior won't save you. I can't believe you would seduce that 18-year-old child." â€œI only love you, Mary-Sue!â€� Daniel wailed. Kaylynn heard this and paused at the door. He'd called her "the maid?" He hadn't even used her name? And he was claiming to love his wife? She suddenly felt stupid and used; he'd never loved her, he'd only wanted a conquest. She ran from the house and jumped in her van and drove home. Daniel was panicking. 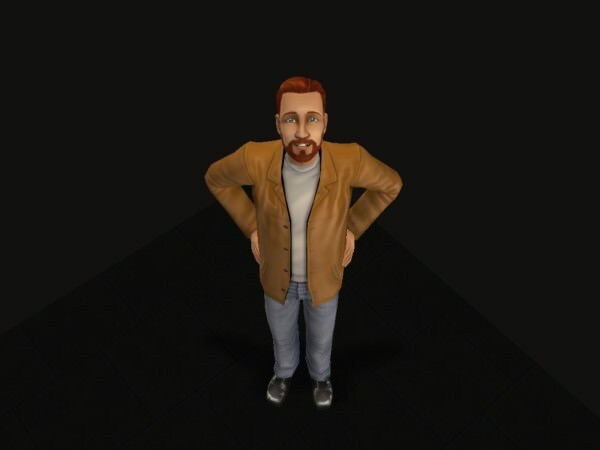 The last thing he wanted was a divorce with evidence of an affair--he knew public opinion in Pleasantview would not look kindly on him after that! 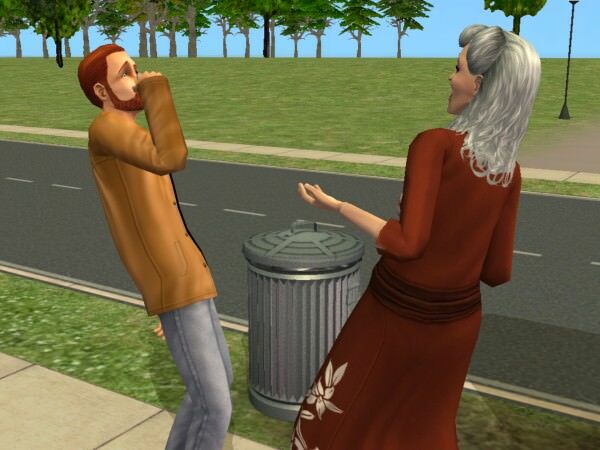 He tried his smooth talk on his wife, but Mary-Sue was having none of it. "Don't even try it. I've had enough of your lies. I want a divorce and I want it now." Mary-Sue spoke calmly. She almost felt like it just didn't even matter anymore. Luckily, divorces in Pleasantview were a simple matter, only needing a statement of the desire to break up, so Mary-Sue got her wish immediately, with no tedious lawyers required. 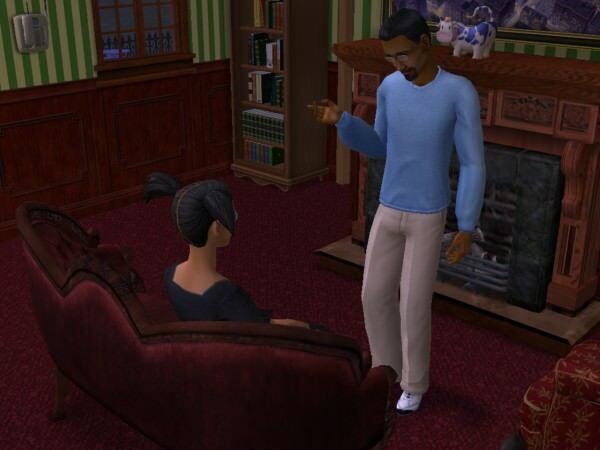 Daniel turned from her and pretended to cry, but Mary-Sue was out of sympathy. 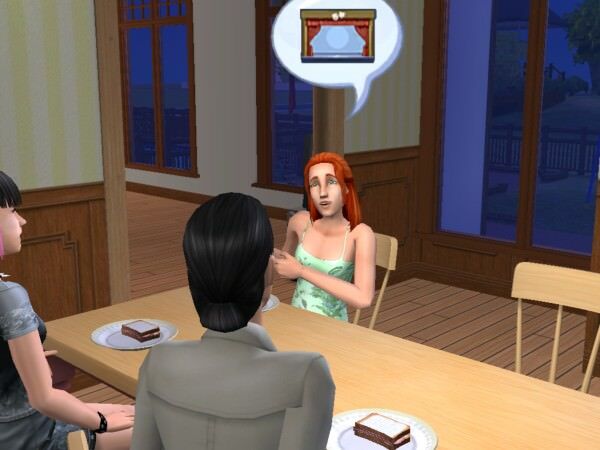 Suddenly, Angela ran into the room, having returned from school and wanting to share the good news that she had received an A+ on her report card, but instead she was just in time to see her parents getting divorced. Daniel turned to run. He was too rushed to even bother to put on clothes, so Angela's boyfriend Dustin Broke, who'd come home with her after school, was a little surprised by the half-naked man who came running out of the house when he was heading in to visit with his girlfriend. 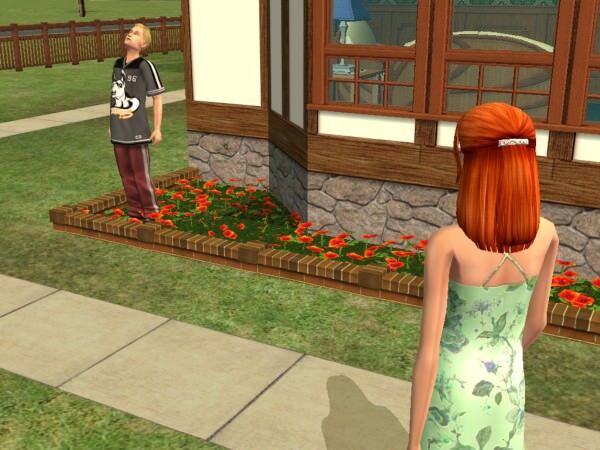 Angela ran outside to chase after her father, but instead found Dustin standing in her flower beds. She loved nature more than anything else, so this infuriated her! "What are you doing?" she yelled. "My mother just dumped my father! I wanted some comfort from you, and you are ruining my prize flowers? Just go home, idiot." Mary-Sue was emotionally exhausted and laid down on the bed to think about what had happened. She suddenly realized where she was and jumped up, just as the doorbell rang. 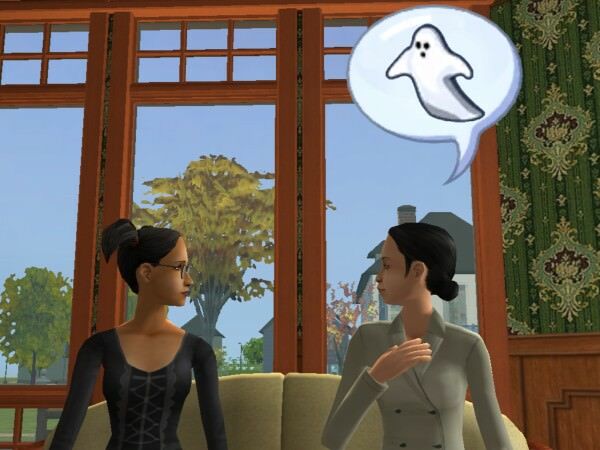 It was her childhood friend, Cassandra Goth. Mary-Sue was glad to have her show up right when she needed her! 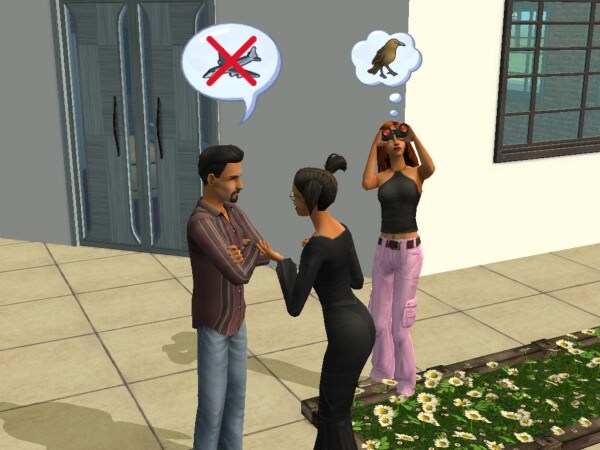 Cassandra had seen Daniel running down the street in his underwear, so she suspected what had happened. 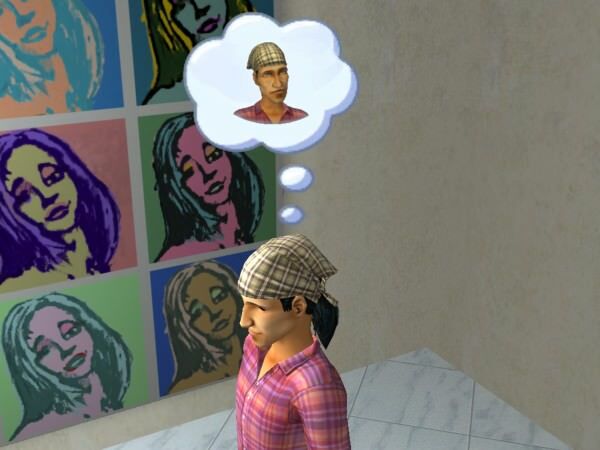 It made her think about her fiance, Don Lothario. She loved him, but was he trustworthy? She'd think about that later--it appeared Mary-Sue needed her. Mary-Sue greeted her friend and told her about Daniel and his latest conquest as they sat on the couch. "Can you believe this, Cassie? That poor girl is only 18 years old! The man has no scruples!" Cassandra replied, "Listen Mares, don't let this get you down. You should do what I'm going to do--I'm on the way to the mall to get some new clothes and a makeover. 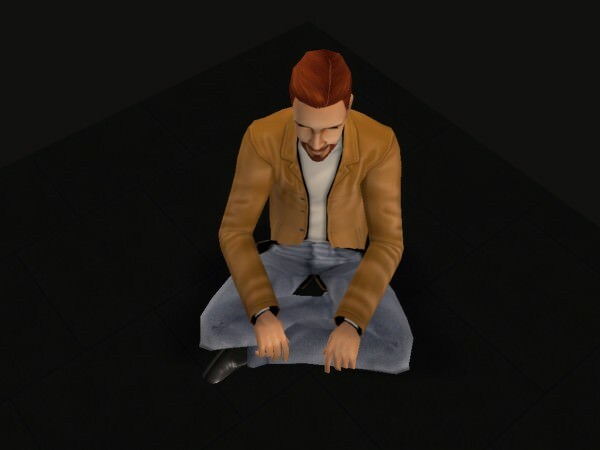 Worrying about Don Lothario's not going to get me down, and you shouldn't let Daniel get you down, either. Take charge of your life and become a new you!" Mary-Sue thanked her for the offer, but said she'd rather stay home and just do a little thinking. "It's still a bit raw right now, but thank you." She chuckled and added, "At the moment, the only thing I can think about is how much I'd like to see Daniel as a ghost." Cassandra laughed along with her friend. "All right--but let's do it soon, okay? I think we could both use makeovers! I'm going to talk to Don and decide if I really want to marry him. I can't get over this suspicion that I'm not the only woman in his life." Mary-Sue looked troubled as she said, "I didn't think anything of it at the time, but I saw Don and Nina Caliente together at the park one day last week. They weren't really doing anything, just eating chili, I think, but they did look pretty comfortable together. I hope it's not what you suspect--but if it turns out to be true, you know I'll have your back." Cassandra wrinkled her forehead. 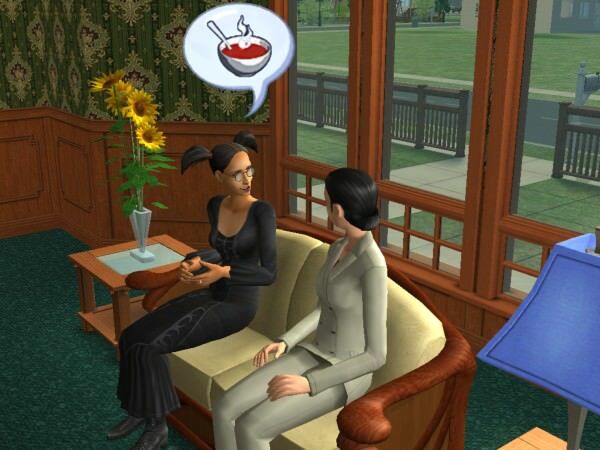 "Eating chili? I'm not sure--he never ate chili with ME!" She shook her head as though to clear it of troubling thoughts and gave her friend a hug. "Never mind--right now we should focus on US, not MEN! Call me tomorrow!" Mary-Sue said goodbye to Cassandra, then realized she was starving. 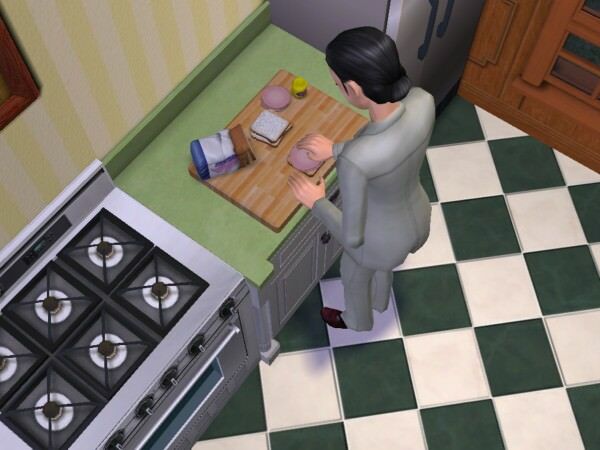 She had never learned how to cook anything since she had always been so busy supporting the family, so she settled for boring lunch meat on boring white bread. "That looks like my life," she mused. "Maybe Cassandra was right--maybe I should look at this as a chance for a new beginning." 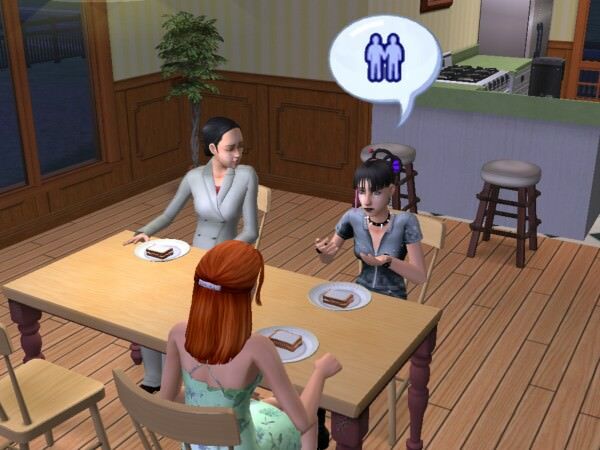 Mary-Sue called the twins to come eat, and then explained the situation to them. Surprisingly, Lilith seemed sympathetic and told her mom that she was well rid of her worthless Dad. "Marriage just isn't right for some people!" she declared. "Dad was never really focused on our family--he always wanted to go off for the weekend and ski. And did you notice he NEVER invited us to go with him? For two people to make a successful marriage, they both have to be committed. He just wasn't." 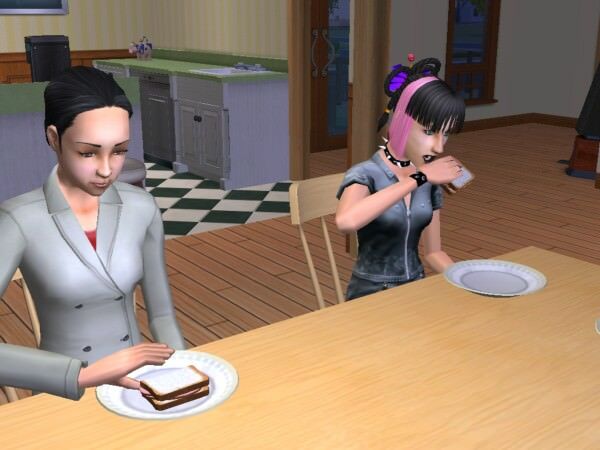 She turned back to her sandwich and took a big bite. Mary-Sue was stunned. Her relationship with Lilith had always been rocky; Lilith had resisted anything she tried to teach her--including potty training!--but here she was showing sympathy and, taking her side? Mary-Sue said softly, "Thank you, sweetie. I appreciate it." As usual, Angela could only think of herself and wanted to discuss the new curtains she was going to get for the window in her bedroom. 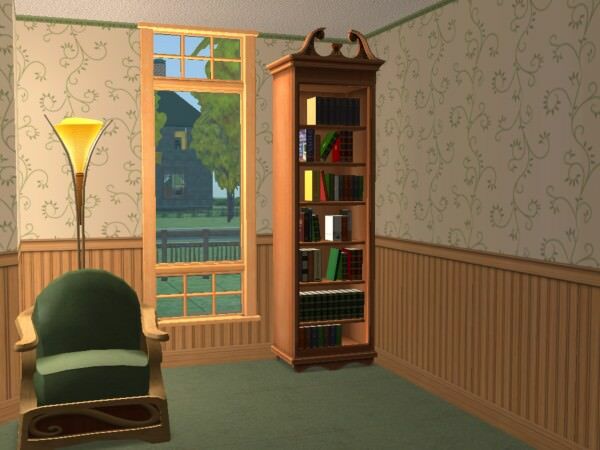 "If we don't have Dad's simoleons anymore," she whined, "Can I still decorate my room?" Angela looked relieved as she headed up the stairs to go to bed. Mary-Sue suddenly felt exhausted and headed off to sleep, but when she saw the bed where she'd caught Daniel and Kaylynn, she looked at it in disgust. 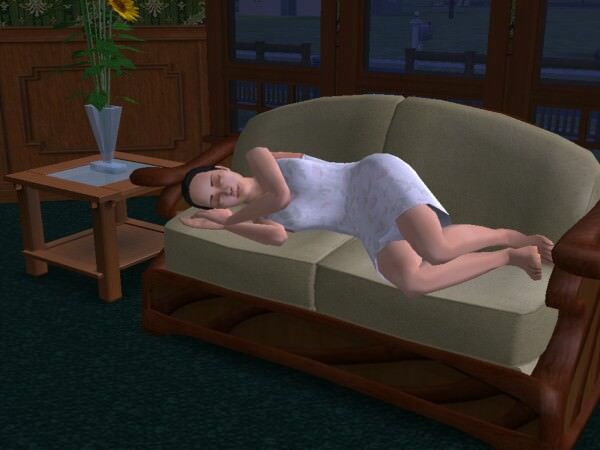 â€œNo way I am going to sleep there!â€� She went into the living room and laid down on the couch instead. Despite the turmoil in her mind, she fell asleep quickly. 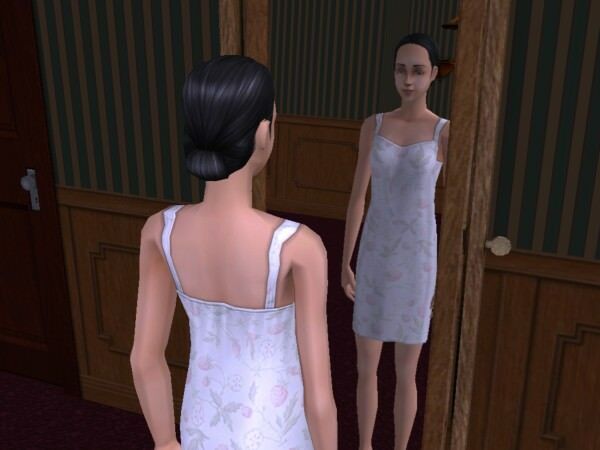 Cassandra's advice to make a new start seeped into her dreams and she suddenly awoke and regarded herself in the mirror. She was 55 years old, but still looked pretty good. "I'm not too old to start over," she thought. "Maybe a fresh start IS just what I need." "Operation New Mary-Sue starts tomorrow!" 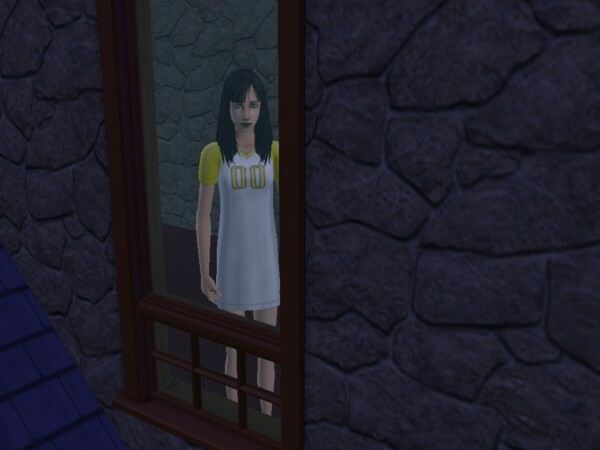 Up in her room, Lilith was gazing out the window, thinking about how she wasn't going to miss her Dad. "He wasn't around much anyway--I barely know who he is," she said to herself. Suddenly she heard a strange sound from outside--a scraping noise. When she peered carefully out the window, it was too dark to tell for sure, but it looked like her Dad was digging a hole in the front yard. She blinked and shook her head, and looked again. It sure seemed like her Dad was digging holes in the yard. "What is up with that?" she wondered. Her Dad's hobby of digging holes all over had started about a year ago, and when questioned, he'd say he just enjoyed the exercise and gaining cleaning skill. "What a jerk!" Lilith said, and went to bed. Mary-Sue awoke before the sun the next day and started step one of Operation New Mary-Sue--getting in shape! She'd start by swimming laps in the pool! That should get her fitness up in no time--as well as being so much fun! 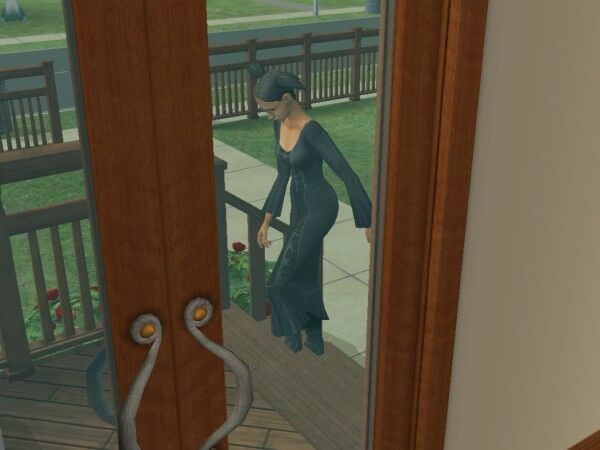 As the sun rose, she heard a shriek from the front yard. It was Angela! 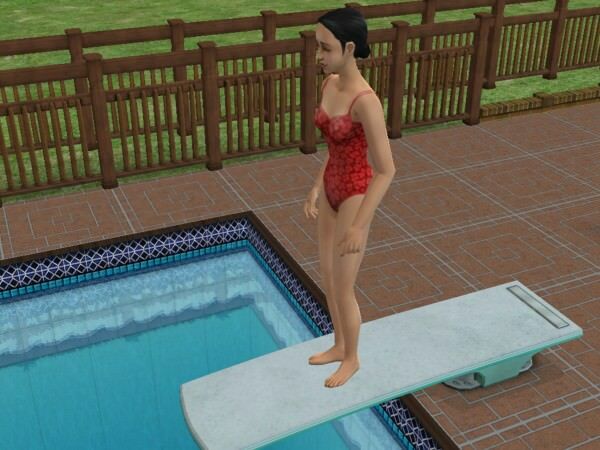 She jumped off the diving board and ran to the front yard to find her daughter yelling in dismay. The front yard was full of holes! What the heck? 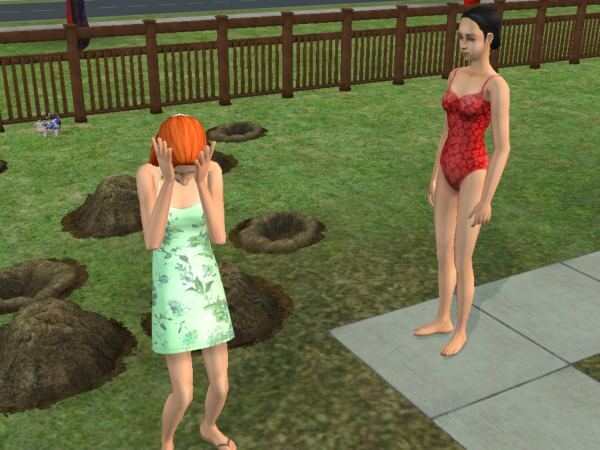 She knew Daniel liked to dig, but she couldn't believe he would have come over in the night to do it. It must have been his last revenge. Or at least, she hoped so. Lilith was stunned. So she HADN'T imagined her father in the yard last night! What a jerk! Mary-Sue then noticed something small and purple on the ground. 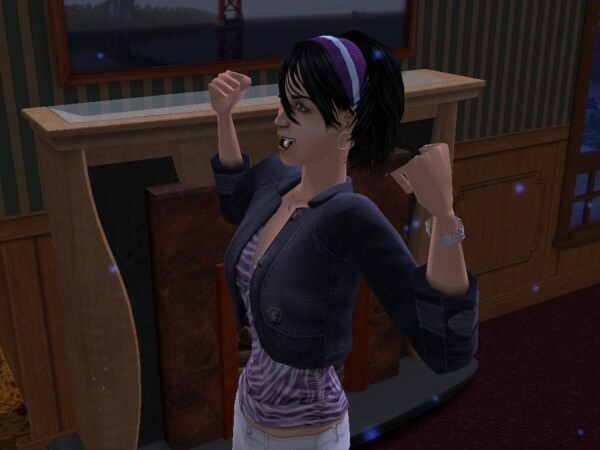 She studied it as Lilith continued yelling about the mess. What WAS that? She looked closer. Was it a cow? Did Daniel leave it there? She shook her head. Nothing he did could surprise her anymore. 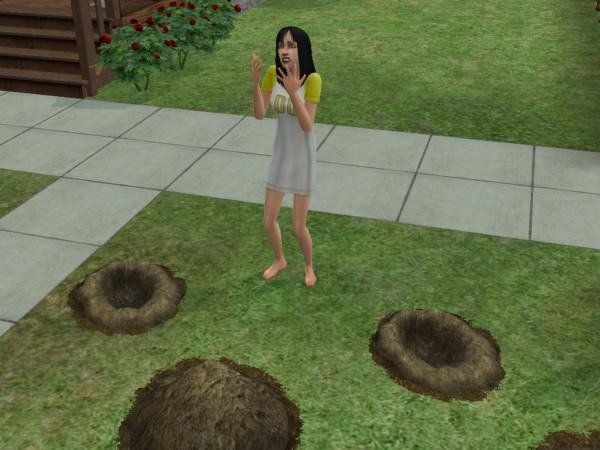 She and the twins worked together to fill in the holes in the yard, and the girls went off to school. Mary-Sue then discovered that Daniel had left one final unpleasant surprise. The jerk had kicked over the trash can and now bugs were infesting the yard. Mary-Sue took a deep breath and cleaned up the mess. 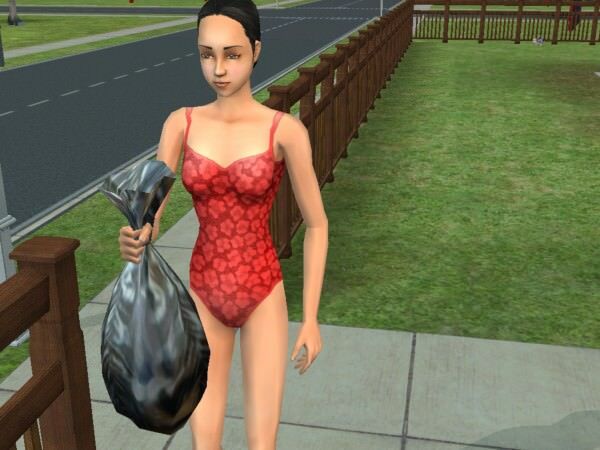 As she picked up the garbage she said to herself, "That's it Daniel. I am throwing you out like this trash!" She carried the trash to the compost bin, brushed off her hands, raised a fist to the sky and shouted, "As God is my witness he's not going to lick me. 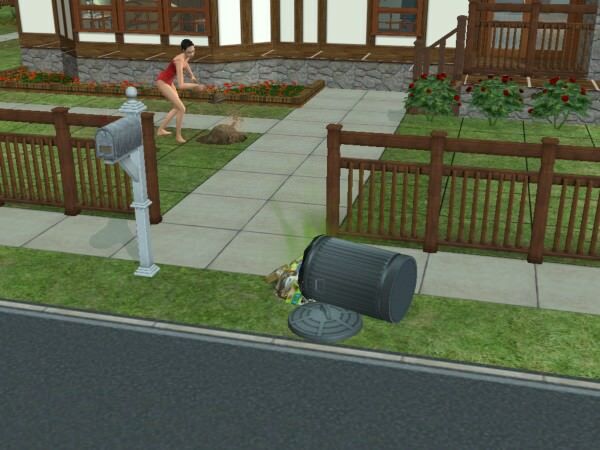 I'm going to live through this and when it's all over, I'll never pick up his garbage again. If I have to lie, steal, cheat or kill, as God is my witness, I'll never be Daniel's trashman again!" Last edited by grumpy_otter : 25th Nov 2018 at 2:46 PM. Thank you so much! Your wish is my command and I have just posted Chapter Two. I hope you enjoy it! Keep it up! I love how you use the conversations they are having to make sense of their lives. Thank you! But I didn't actually know I was doing that, lol! I'll try to keep it up. 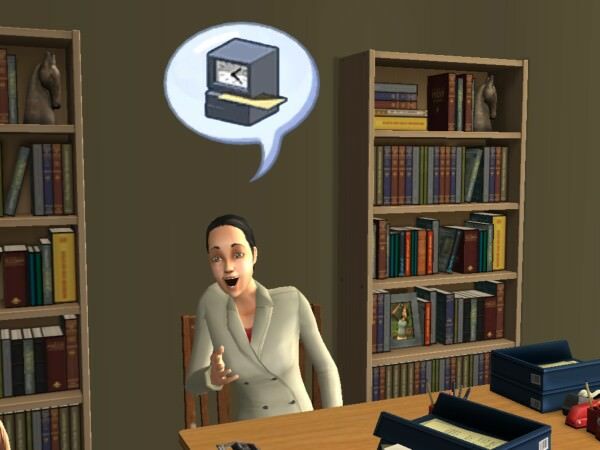 I mostly just yammer on about what I enjoy about my Sims! whens the next chapter out? So far the story is not a surprise, but I like it so far; please do continue! Will Cassandra drop Don like the hot rock that he is? Will Mary Sue every wear anything besides that business suit? And what about those twins? Should be tomorrow! Just proofreading now. That is really funny you mention the business suits--I was just tweaking that part of the story! I know it's very familiar--but I think that's part of the appeal of writing about the Pleasants--everyone knows them so well. I just hope my twist on them will be entertaining. After Mary-Sue divorced him, Daniel felt a strange compulsion. He HAD to leave his house! He would have liked to put on clothes and grab his wallet, but some strange force was pushing him to run away. 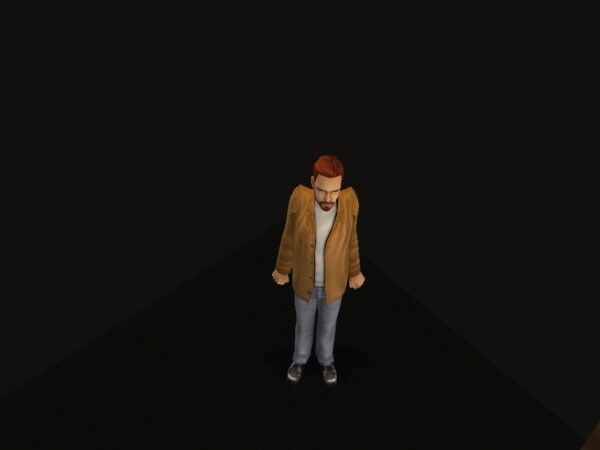 As he came to the edge of his lot, he felt a strange emptiness. His house disappeared, his neighborhood disappeared, and his body was lifted and twisted, and then . . . a void. "What the hell is going on?" he wondered. He was in a dark empty space, something like a bin. His body tingled, and he realized that he was back in his clothes. "Where did these come from? I left the house in my underwear!" Although his surroundings were strange, Daniel was oddly comfortable. He knew no one could bother him here, that he didn't have any pressures to perform, and that he might enjoy this blissful nothingness. He sat down to think. "This is nice, but I'd rather get back to my life. I need a new place to live--somewhere cheap until I can access my funds. I wonder if there's a good place like that in Pleasantview where I can go?" His voice bounced and echoed in the bin. No one was listening, he guessed. With a start, Daniel felt himself grabbed by an invisible hand and he began flying through the air. He closed his eyes in panic. Then he was still, and could sense the ground beneath his feet, and the light had become much brighter. He opened his eyes and steadied himself, and looked around. "A trailer park? Okay, well I guess that will do for now. It'll be cheap, anyway." Daniel had no recollection of choosing a unit, but the price seemed right so he took the clipboard from the woman and looked at it. The form was blurry and hard to read, but he managed to find the signature line and affixed his name. Daniel then walked into the trailer that he somehow knew was his, and examined it. It was sparse and cheap and boring, but he could easily decorate it so it wouldn't be a too-unpleasant place to live while he made plans for his future. The large closet would also be useful. He went outside to explore the community, and found a nice little playground. 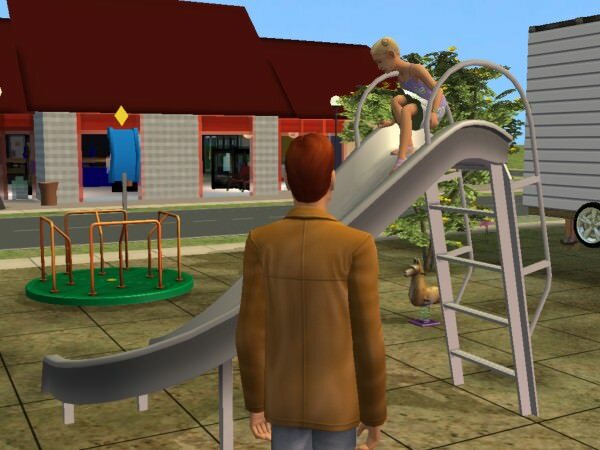 He observed some of the other inhabitants of the trailer park, including a little girl playing on the slide. He spoke to her, and she surprised him with her expansive introduction. "My name's Sharla! My family is Ottomas! I have a big brother and a little brother and a mommy who has babies in her tummy! I like to ride the twirly-whirly! Will you push me on it?" Daniel agreed. Little girls often had mothers, or grandmothers, who could be worth his time. He'd been right in this case. Daniel quickly turned his attention to Sharla's delightful grandmother, Dora. He started in with his usual line about being a skiing champion, but Dora was not interested. She was so appealing however, that Daniel turned his charm on to the highest level and smooth-talked her with the gift of a rose. This made her very receptive to his charms and they engaged in a mutual expression of admiration. â€œOooh baby,â€� Dora said, as she performed a little shimmy. Dora couldn't monopolize his attention for long though--every time he turned around he spotted another lovely resident of the trailer park. La Shawn Cameron initially rebuffed his attentions. 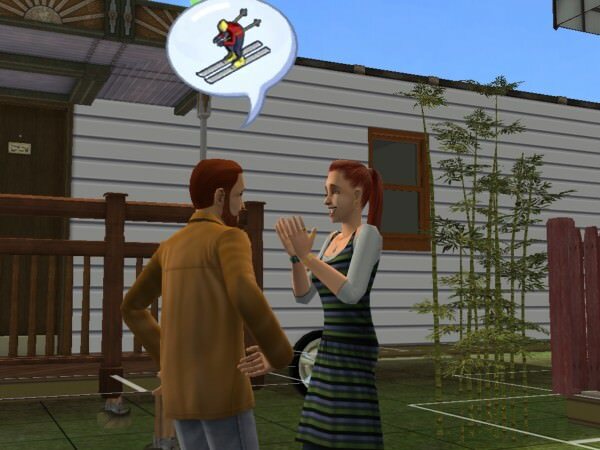 He then explained to her that he used to be a professional skiing star, and she warmed up to his flirting. Calista Fuchs was his next target. "Oh!" he laughed, "Did I say 'skiing?' I meant tennis!" For some reason, Calista found this much more appealing. Daniel spotted yet another beautiful neighbor, the exotic and appealing Michelle Tse. 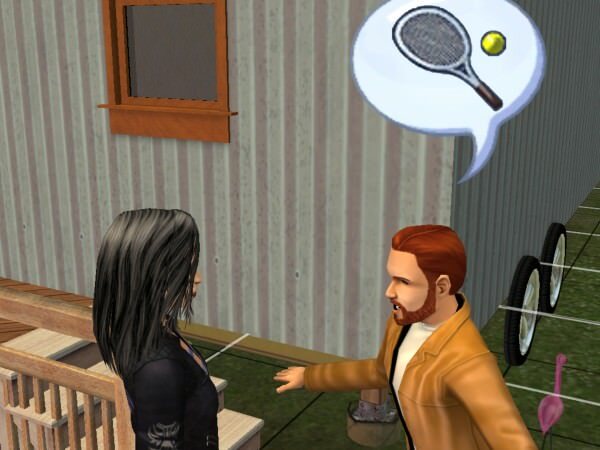 He decided to try the tennis story on her. The skiing story worked for him this time. Daniel turned from Michelle and noticed ANOTHER beautiful woman, just walking past on the sidewalk. He greeted her, and learned her name was Marie Rauscher. She immediately responded to his lie. Daniel couldn't believe his luck in renting a trailer in a place with so many beautiful residents and neighbors. Suddenly he stood straight. He'd just spotted a stunning creature. She interrupted his story with her laughter. Daniel stepped back just as the sun sank and watched the gorgeous creature head for Michelle's trailer. What could possibly be wrong with her that she didn't respond to him? And why did she call him â€œcatcher?â€� He hadn't mentioned baseball! Oh well, he thought, and looked around in satisfaction. 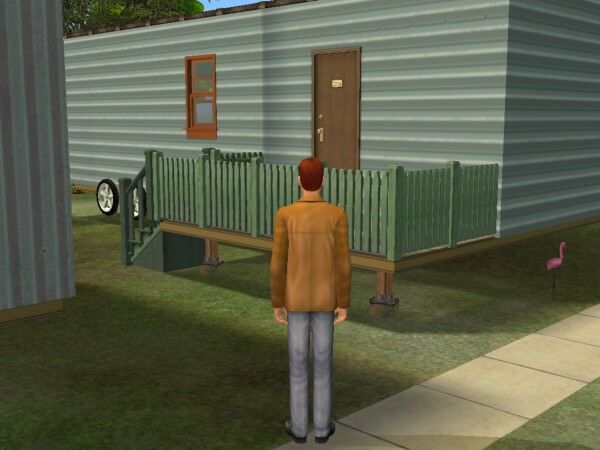 He wasn't quite sure how he'd landed in this trailer park, but it seemed like not only was it going to be a good cheap place to live, but his romantic desires were going to have plenty of opportunities here! He heard the slap of a screen door and saw a lovely blonde woman come out of the trailer across the way and call Sharla to come in for dinner. Daniel waved her over so he could introduce himself. He learned her name was Samantha Ottomas and that she was expecting new babies any minute now. 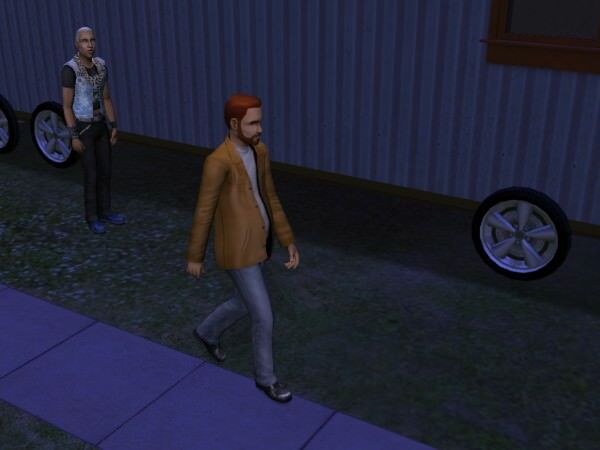 Armed with a collection of new romantic contacts, Daniel headed back to his trailer to work on his plans. 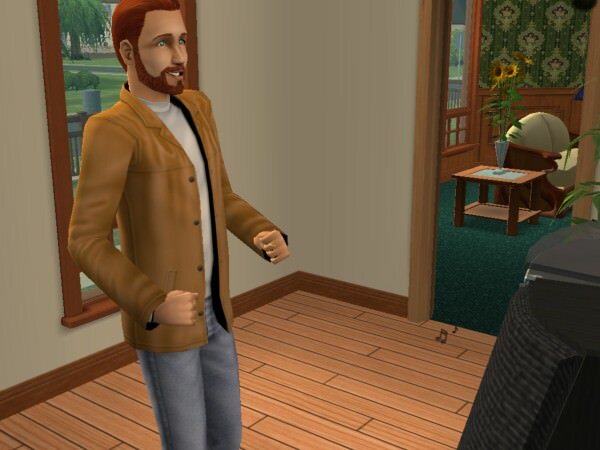 A very nice old man stepped up to introduce himself but Daniel brushed him off. He wasn't interested in meeting anyone he couldn't smooth talk into his bedroom. When he got home, Daniel spent a little time purchasing some items for his trailer, then admired his new decor. This was just his style, and made his place nice and comfortable for the work he wanted to do--both in and out of bed. A knock sounded on his door, and he opened it to find Dora Ottomas. "Hello, Daniel," she purred, "I thought I'd come by and formally welcome you to the neighborhood. Will you invite me in?" Daniel smiled broadly as he replied, "Of course! Make yourself at home!" Daniel was so pleased. 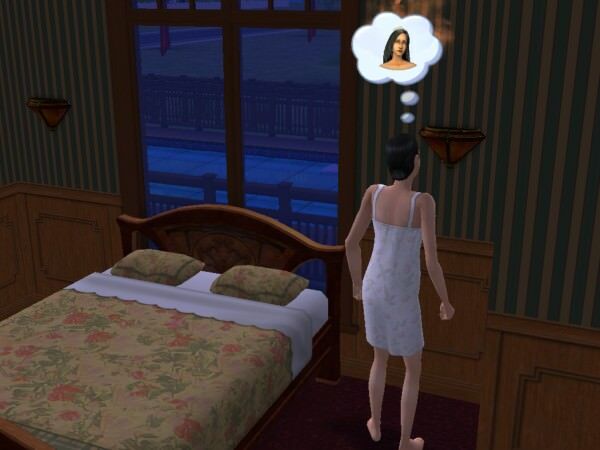 He'd started the day in bed with a beautiful woman, and was about to end it in bed with an even MORE beautiful woman. Was there any man luckier than he? He knew exactly what to say to seal the deal. It turned out Dora LOVED skiing. Maybe she'd just been playing hard to get earlier. 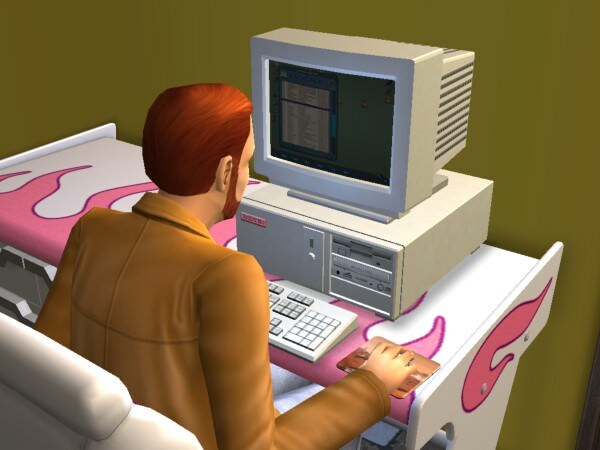 After Dora had returned to her own trailer, Daniel got dressed and went to his computer to contact his business partners. The divorce had changed the timetable for his plans and he needed to make some new arrangements. He jumped as his work was interrupted by a loud shriek from outside. 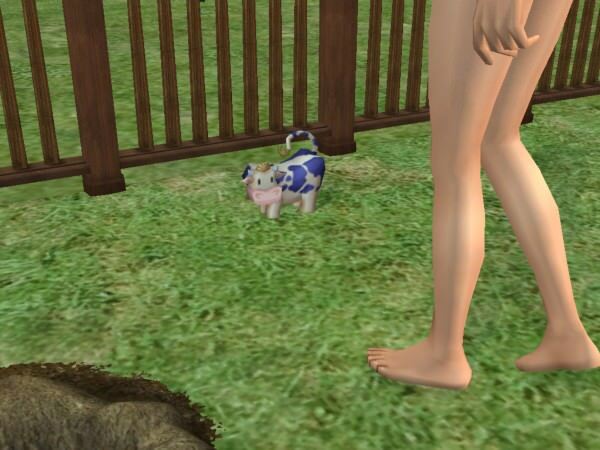 He ran to the courtyard of the trailer park and found his new neighbor, Samantha Ottomas, about to give birth! Despite her cries, the birth seemed fairly quick and painless as the baby floated down from the sky into Samantha's arms. 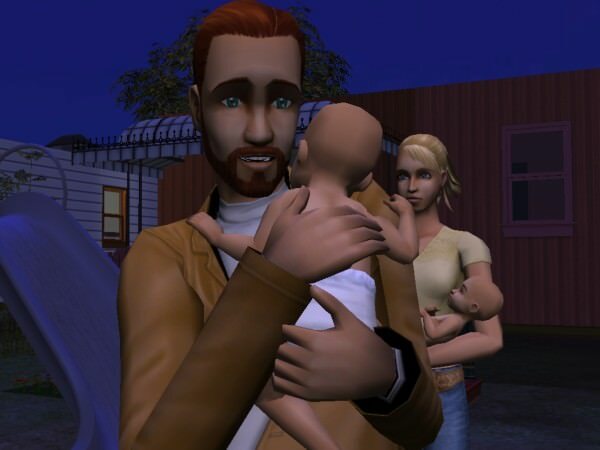 Before he knew what was happening, Samantha thrust the baby at him to hold and gave birth to ANOTHER baby! "I really appreciate the help. What a welcome to the neighborhood, huh?" Daniel laughed, uncomfortable with the small person in his arms, but not wanting to repel Samantha. Now that she wasn't pregnant, he might add her to his list. Samantha continued, "My husband would have been here but he had a meeting at his club tonight. Oh, here's Gran. She can take the baby." Samantha called out to Dora to come take the baby from Daniel. The tiny person snuggled up to Daniel's neck and he felt an unfamiliar warm sensation in his heart. As Dora approached, he was almost reluctant to hand the baby over to her. 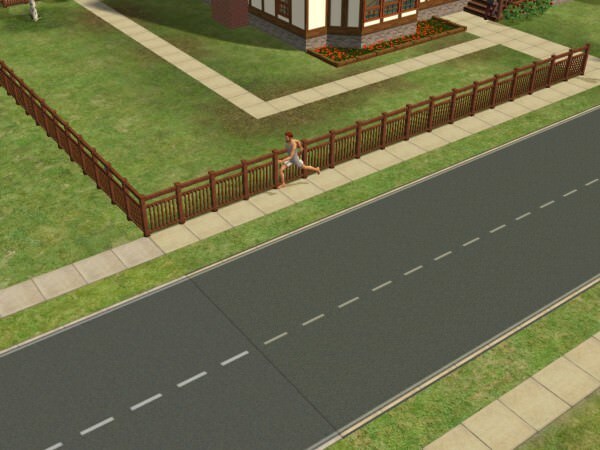 Then he shook himself and said goodbye to his newest neighbors. 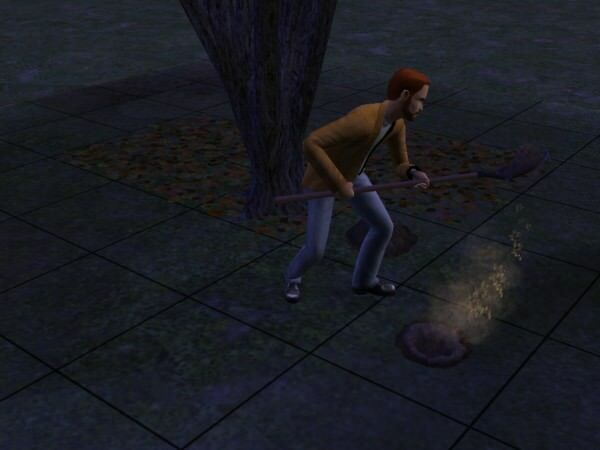 Back home, he waited until the night was darkest and then snuck out behind his trailer to do some digging. As he went inside to finally sleep after his long and busy day, he reflected that this new place to live was going to be just perfect. 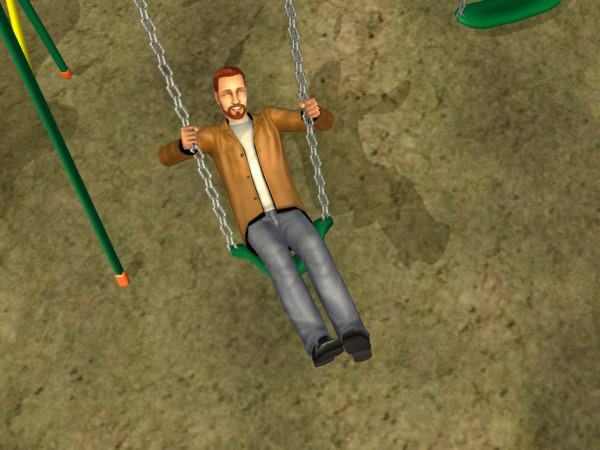 Beautiful neighbors, a fun swing, and a great place to dig. Last edited by grumpy_otter : 24th Nov 2018 at 5:10 PM. just saying this could all be one big dream and in reality life is normal,anyone agree? I'm glad you're interested! Thank you! After she'd cleaned up Daniel's trash, Mary-Sue wandered over to the piano and fiddled with a few notes. She wasn't very good at it, but she still loved music as much as she had as a child. She was interrupted by a call--it was Cassandra, who was already on her way over away for "Phase One of Operation New Mary-Sue!" While she was getting dressed, she heard some clattering and banging in the backyard, and went outside to discover. . . a thing. Cassandra came up to her and said "Well? What do you think?" 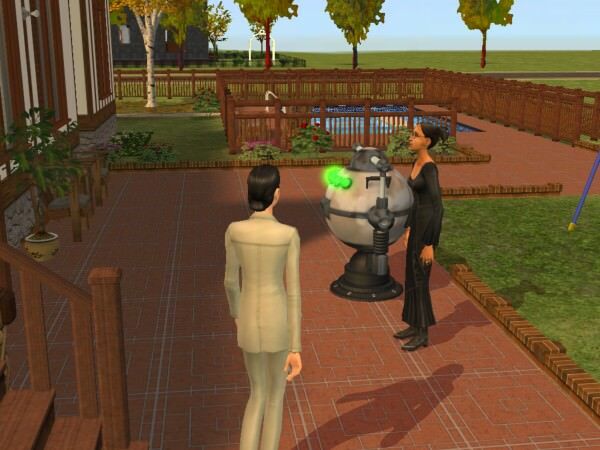 Mary-Sue laughed, "I think you brought me a really ugly robot yard gnome." Cassandra joined her. "Haven't you seen one before? It can change your desires! This will make you want to study music again like you used to." Cassandra reflected to herself that maybe it would also help her friend be more nice and playful, like she was before Daniel took away so much of her exuberance. Mary-Sue started to object, but Cassandra cut her off as she went on hurriedly. "Look, your whole life when I knew you before Daniel you loved learning things and playing music. It was only after you got married that you became so focused on fortune. 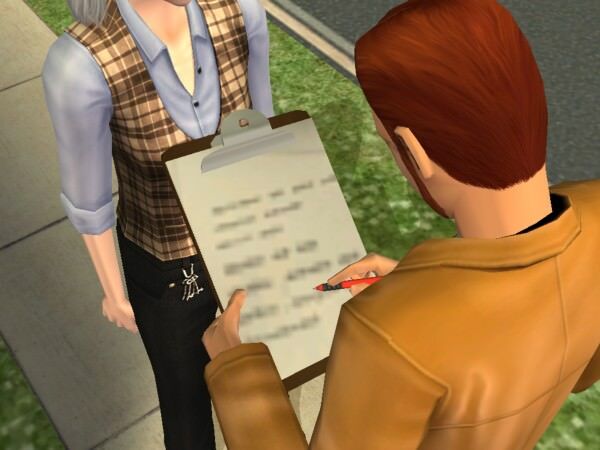 I know, I know, you had to be because Daniel was worthless at supporting the family, but I think you need to get back to the Mary-Sue that had passion for things other than making simoleons. This," she gestured at the machine, "will do that." Mary-Sue was skeptical but she trusted her friend. Mostly. "It'll rattle your brains a bit," Cassandra admitted, "but it doesn't really hurt. And believe me, you'll feel a whole new passion for your life when you're done." Mary-Sue took a deep breath and stuck her head in the machine. 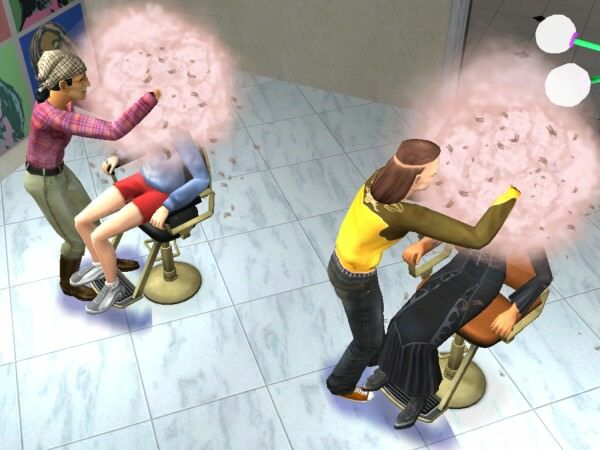 As Cassandra had predicted, her brains rattled around some, but it didn't hurt. Instead, she felt all her simoleon worries floating away and a new desire to build her creativity take its place. She pulled her head out and staggered a bit. "Holy cow!" she exclaimed to her friend. "You weren't kidding! Listen, can I meet you at the mall later and we'll do our makeovers then? I've got something I need to do right now." Cassandra agreed. "No problem--that will work better for me anyway. 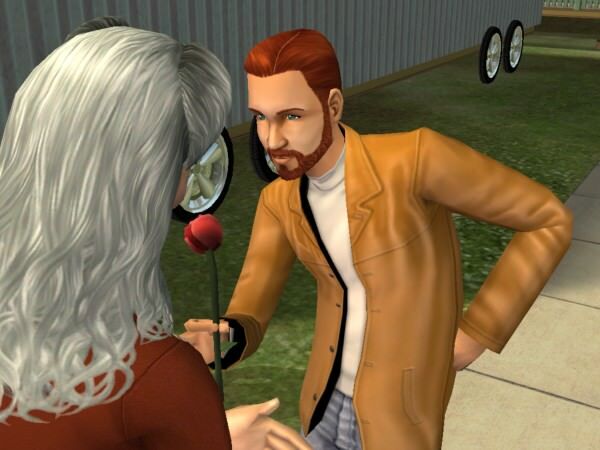 I have to go return Don Lothario's ring to him." "Wait! What? What happened?" Mary-Sue asked. Cassandra smiled. "You're going to love this story--but I'll tell you later. Let me go finish it and I'll meet you at the mall this afternoon." 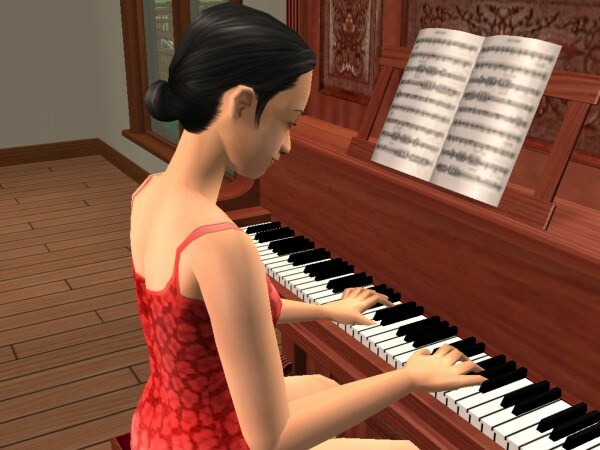 Mary-Sue immediately went to the piano and began building her skill, and Cassandra left on her romantic errand. 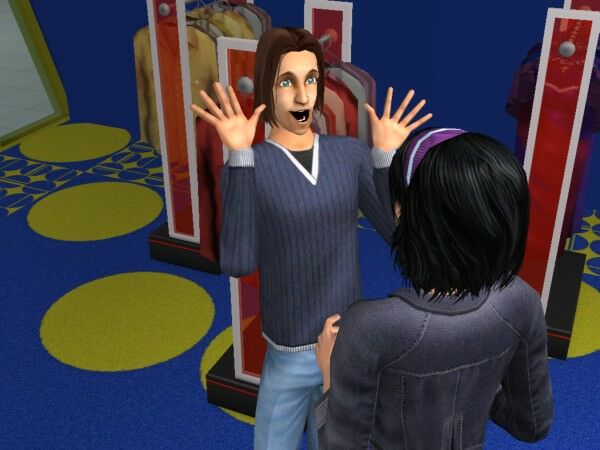 When they met at the mall later and Cassandra saw her friend, she was surprised. "What are you wearing?" she asked. Mary-Sue jumped up and bounced as she exclaimed, "I got a new job! Right after I rattled my brains I knew I couldn't go back to that prison of a campaign office, so I called them up and quit!" Cassandra was delighted. "Gosh, that's great! So what's your new job? Something with music?" "Well no, at least not directly yet. Right now I'm a playground monitor at the elementary school, but eventually I can teach music! And I tell you what--just going in to the school for the interview made me feel so free and happy. I don't think I'd realized how much that political job was dragging me down." Cassandra laughed. 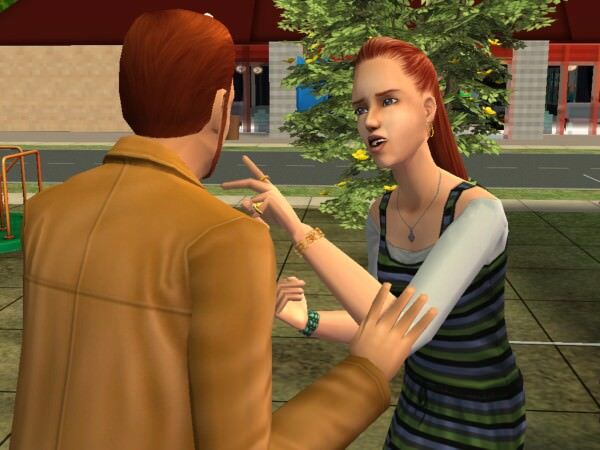 "I thought I was going to have to DRAG you to make any changes, and look at you! Quitting jobs and stuff! 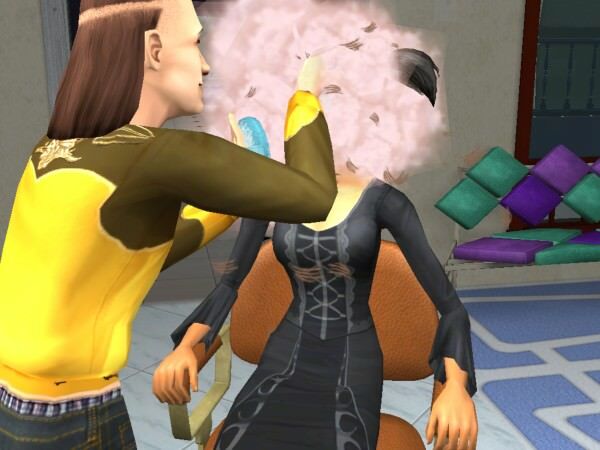 I think you're ready for your makeover!" The women headed into the mall and marveled at its amazing design. Somehow the architect had designed a roof that was open to the sky. It was intentionally breathtaking, and not at all an accident because the architect couldn't figure out how to include a ceiling. When they got to the hair salon, Cassandra whispered to Mary-Sue, "Would you prefer the interesting cowboy or Mr. Bandana?" Mary-Sue chuckled and began to reply, but was interrupted by the "Bandana Man" calling to her. "Bonjour Madame! I am Francois and I will be delighted to achieve Madame's desires! What does Madame wish today?" Mary-Sue whispered to him to explain how she wanted her hair done. Francois frowned. "Is Madame sure? That is quite . . . unique for Madame." Mary-Sue assured him she knew what she wanted. Meanwhile Cassandra had headed for the other chair. "Hi!" the cowboy said, "I'm Butch! Please sit and I will transform you!" Cassandra sat down, but before she could explain what style she wanted, Butch had jumped right in. Suddenly the room was whirl of activity! Under her cloud, Mary-Sue was a bit worried by Francois' exuberance, but hoped for the best. 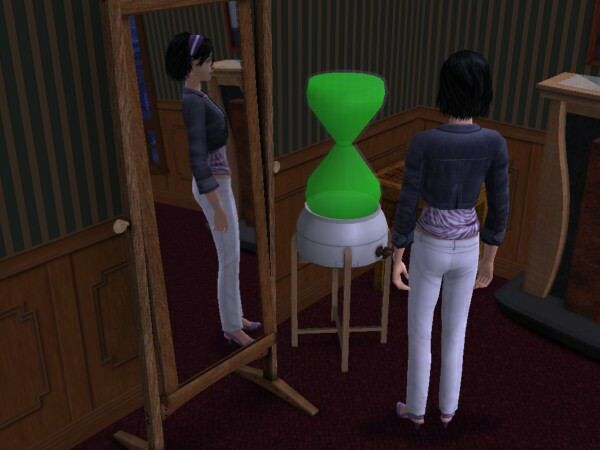 When he'd finished, Mary-Sue admired her reflection. Cassandra would LOVE this! 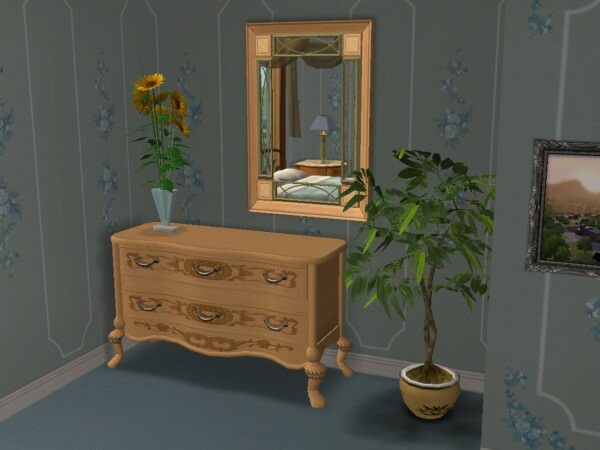 On the other side of the room, Butch handed Cassandra a mirror so she could see what he'd done. "Do you think this is funny?" she asked. Mary-Sue had thought she'd play a joke on Cassandra by getting a ridiculous look, but when she saw her friend she couldn't contain herself. "I think you won this contest!" 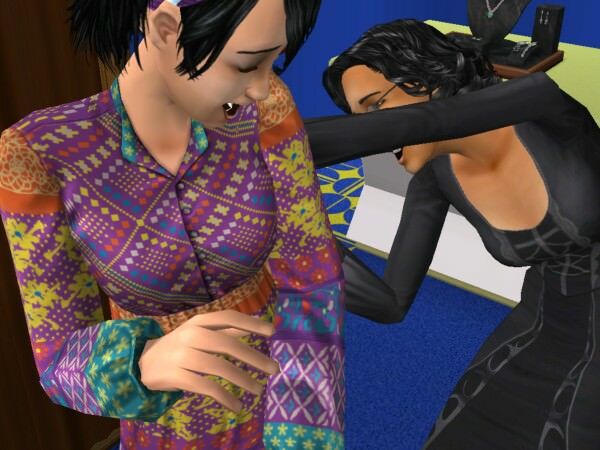 Cassandra tried to stay serious but she was so happy to see her friend laughing that she had to join in. Finally Cassandra dried her eyes and snorted. "All right, enough! Let's do it right this time!" They put Butch and Francois through their paces again, and now it was just what each had really wanted. 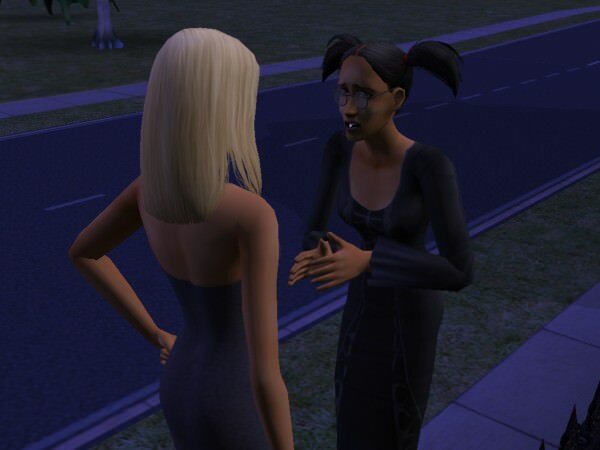 Cassandra gushed at Mary-Sue, "You just took 20 years off! This is fantastic!" Mary-Sue returned the compliment. "But what about you? This is great! I love it!" While the women raved about their looks, Francois thought about his favorite subject. 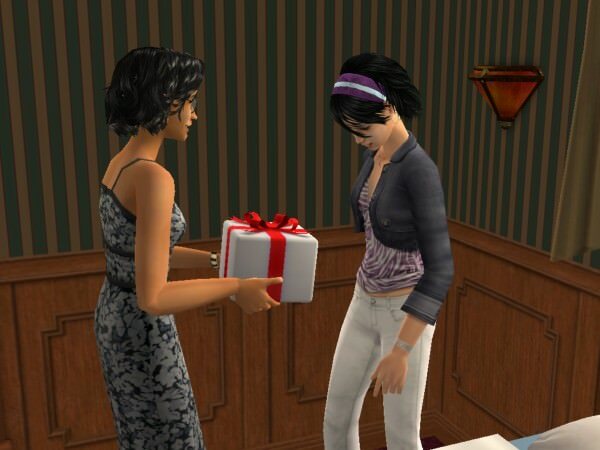 "Okay, now it's time for clothes," Cassandra said, "and listen, I want this to be my present to you. Call it a 'happy birthday' for the first day of the new you!" 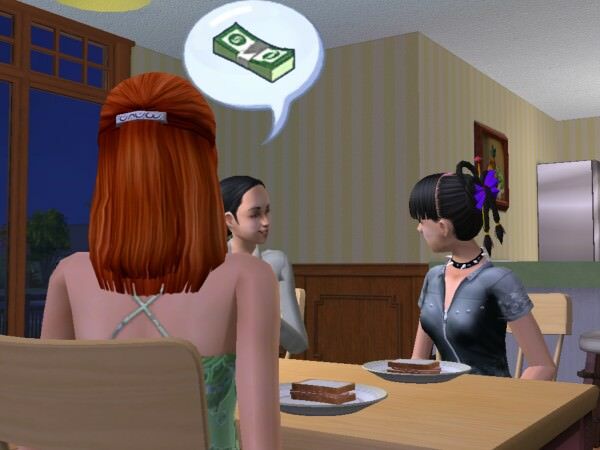 Mary-Sue was going to object but then thought that with her sudden career change, she'd probably need to be careful with her spending, so she accepted Cassie's offer gratefully. "Okay, but let me treat us to a snack--I'm thirsty!" As they made their selections, Cassandra noticed the photo booth and said, "Oh, we're going to do that after we get our new outfits!" 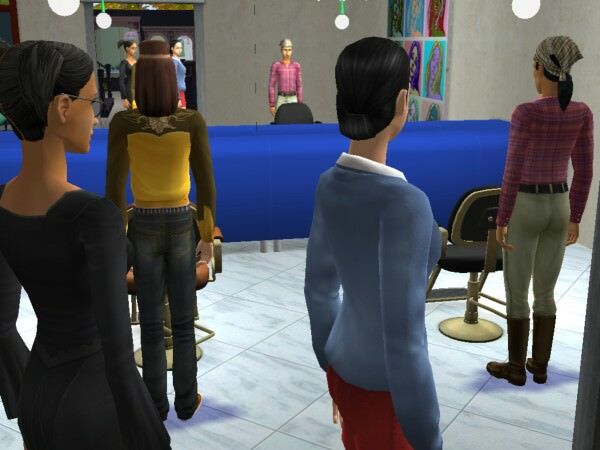 They headed into the clothing store to check out the merchandise. 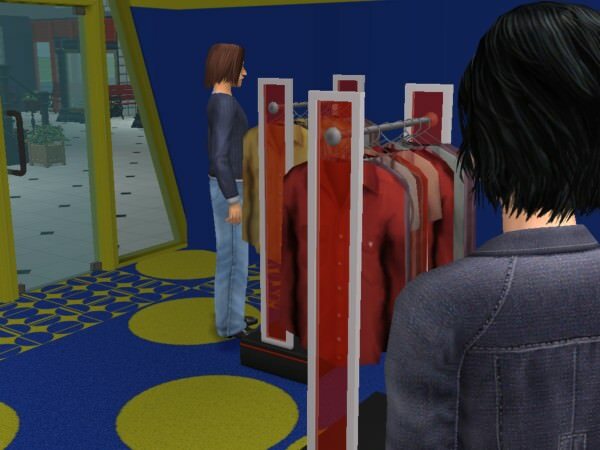 Amazingly, it seemed that in Pleasantview every clothing store carried the exact same inventory, so Mary-Sue was already familiar with the choices and knew what she wanted. 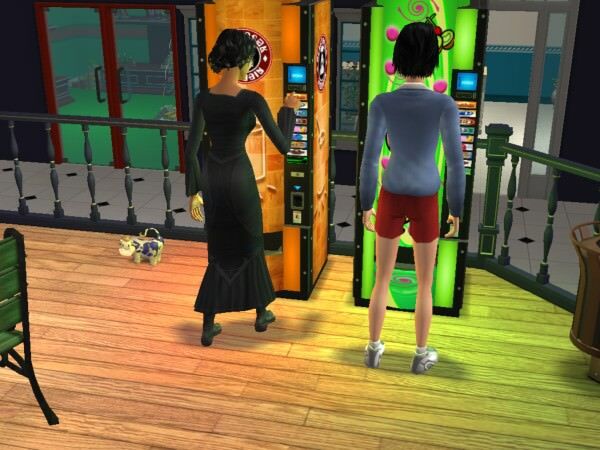 Additionally, each rack seemed to have hundreds of outfits to adorn every Sim, even though it appeared only eight were actually hanging there. Mary-Sue checked out the clothes while Cassandra daydreamed. 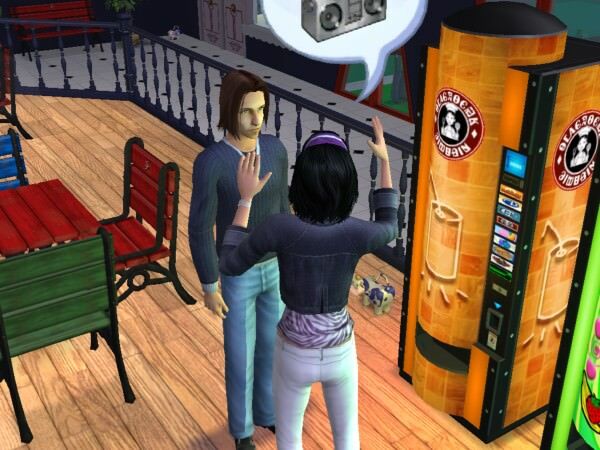 Mary-Sue made her choices and Cassandra shoved her toward the changing booth. "Go put it on! I want to see!" As Mary-Sue appeared in her new outfit, Cassandra said hesitantly, "Oh. Well. That's certainly . . . different." Mary-Sue busted out laughing. "Did you think I was serious? Yeah, I am going to start eating granola and braiding hemp in addition to getting a new job." Cassandra shoved her playfully. 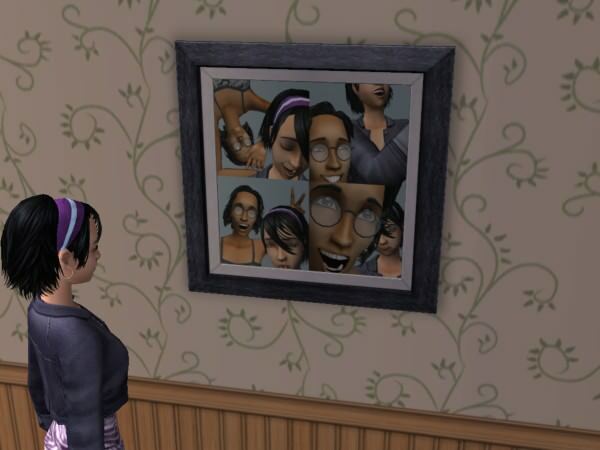 "All right, let's see the real one now!" Mary-Sue headed back into the changing booth and reappeared quickly. Cassandra's enthusiasm did not need to be faked this time. "I love it! 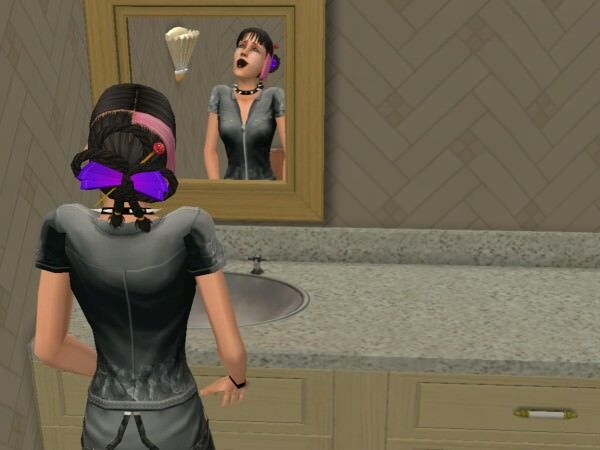 The purple shirt goes with your hairband! And it's young-looking, but not TOO young-looking." Mary-Sue agreed, "Yeah, I wanted something that wouldn't make me look like an old woman trying to look like a teenager." 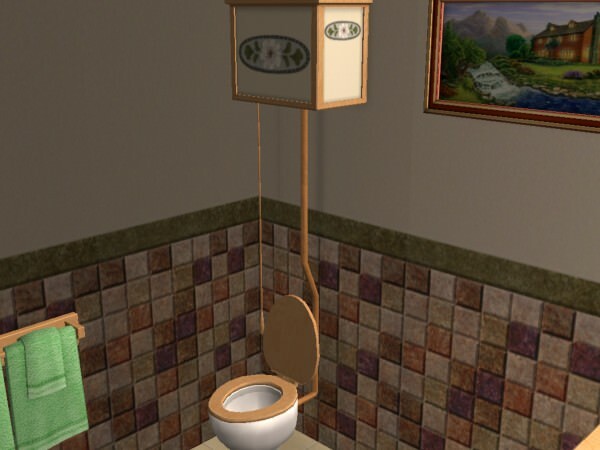 Cassandra replied, "Speaking of being an old woman, I've got a present for you when we get back to the house. But right now it's my turn to get something different." "Really? I like your dress. 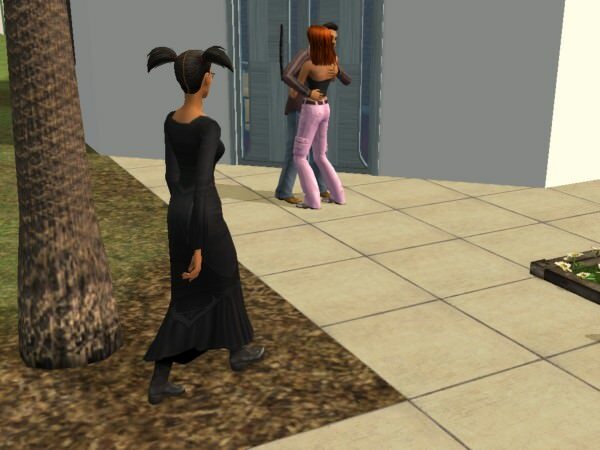 Your last name IS Goth, after all." "Oh yes, hello, just call me Morticia! No, seriously--this thing is ugly and dark. I need a change too!" The dress she chose had a suggestion of blackness, her signature color, but was much more playful and bright than her previous ghoul look. "I love it," said Mary-Sue. "You look younger too!" She continued, "Thank you for doing this for me. It's been such a great distraction from all the recent turmoil." 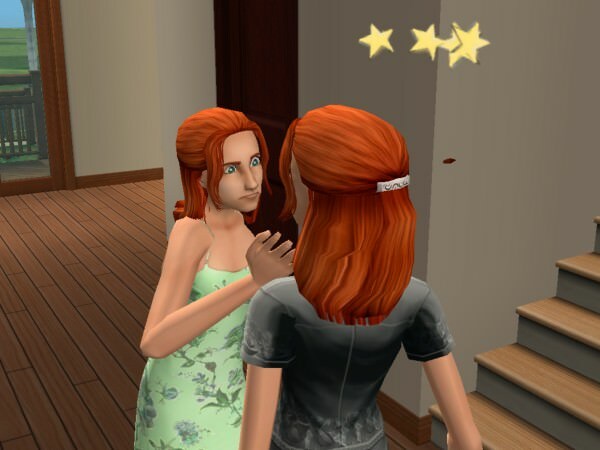 Mary-Sue looked in the mirror, almost disbelieving that this new person was herself. Then she noticed a handsome young man behind her, browsing the clothing racks. Wow, she thought, cute. If only I'd met him when I was 20! To her surprise, the young man smiled at her and walked right up to introduce himself. "Hi, I'm Cyd Roseland. I just moved here--but I think I saw you last week at the politics office? I'd come in to register to vote." Mary-Sue returned the introduction, then explained that she'd since left that job and would now be working in the education career as a playground monitor. Cyd squealed excitedly, "Me too! I just got the same job! Maybe I'll see you at work!" Mary-Sue thought he certainly seemed eager about the possibility of seeing her again. "Well that's good, so I'll see you around, then." Cyd didn't seem to want to stop talking to her though, and proceeded to tell her a joke that made her react in a hilariously exaggerated way. She felt a slight flutter in her heart but told herself it was ridiculous. 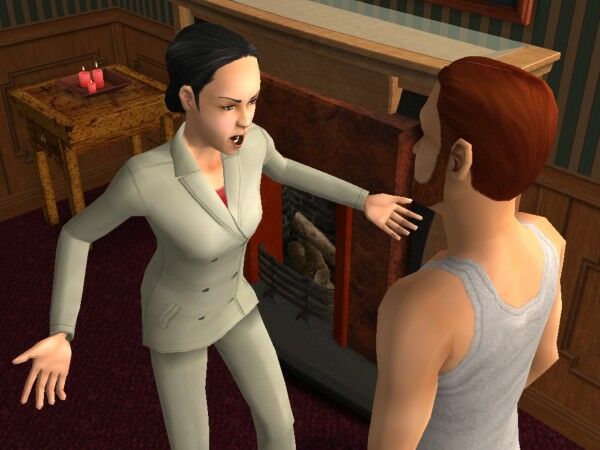 "You're old enough to be his mother! Or at least his aunt." She finally excused herself and went to find Cassandra so they could do their portrait in the photo booth--goofy, of course! 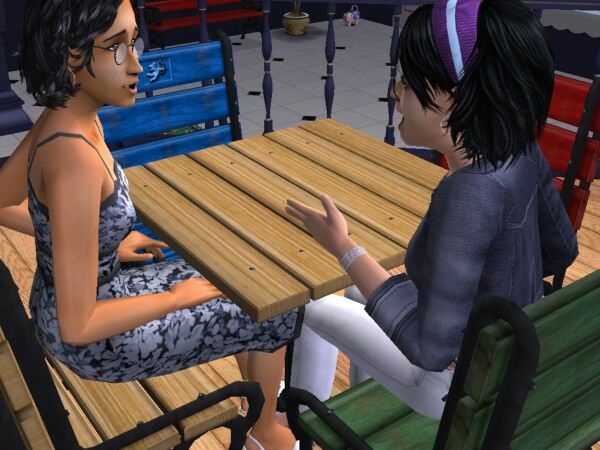 Cassandra collected the photo, then grabbed Mary-Sue's hand and pulled her over to a table on the center island. "Okay, sit down, now I want to tell you what happened with Don!" Mary-Sue made herself comfortable and grinned at Cassandra's excitement about her romantic entanglements. Was there anything better than a good friend? Last edited by grumpy_otter : 27th Nov 2018 at 2:18 AM. I think the next chapter will put that question to rest! "More than friends" - please, NO! "The architect didn't know how to build a roof" hahahah. 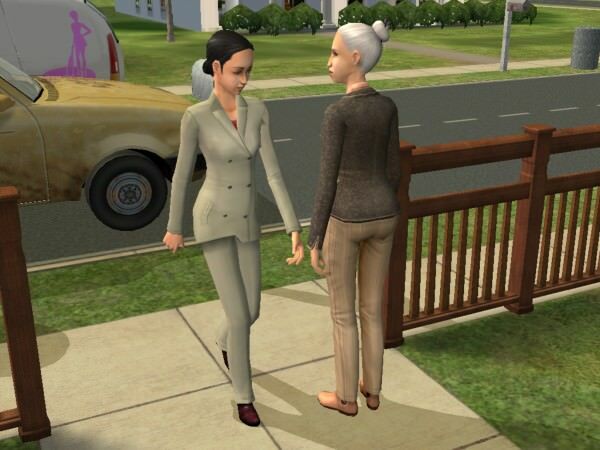 Cassandra began telling Mary-Sue about her former fiance, Don Lothario. "Oh yeah! 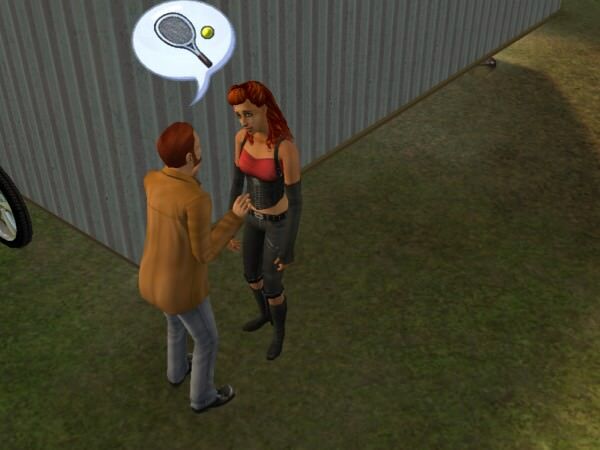 You said you gave him back his ring?" "Yes, I just did that--but first let me tell you about last night! I called him up and asked him to come over so we could talk. He said he'd be happy to come over, but asked if 'my friend' could come over, too. I really wanted a private talk, but I didn't want to sound rude, so I said okay. "When he arrives, guess who he brought with him?" "Dina Caliente! I couldn't believe it! She was following along behind him, and I could tell she was thinking about him!" "I'd been planning to let him down gently and give him a chance to explain, but when he showed up with Dina it was obvious there was something between them. I still can't figure out why he brought her over--either he's just that stupid or he wanted to flaunt her in front of me. Either way, I'm sure I made the right decision to dump him. Dealing with him has become so tedious and boring." "I told him that it just wasn't going to work out, and that it was time to push away from each other. 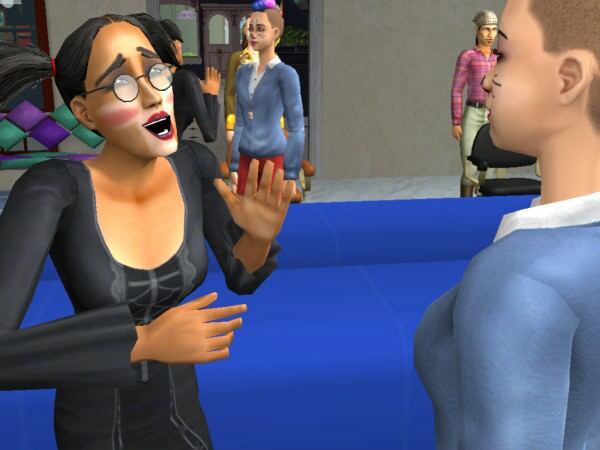 Mary-Sue was stunned at Cassandra's story. "How could he DO that! I knew he was maybe seeing Nina, but her sister, too? The nerve of that guy! So then he left?" 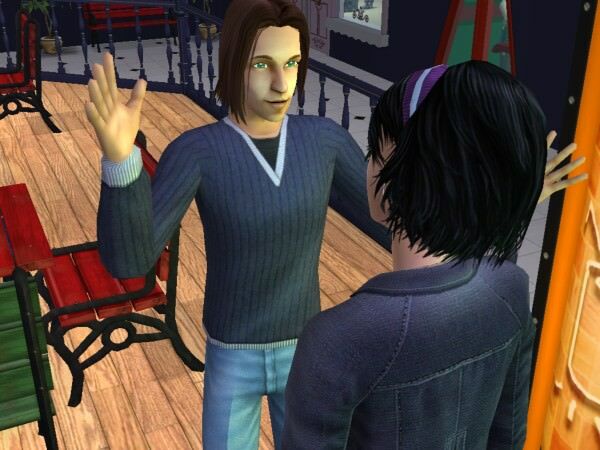 Cassandra continued, "Yes, I threw him out, but in the excitement I forgot to give him back his ring. That's what I did today. That's ANOTHER story! After I left you this morning I went to his house and GUESS who was there with him this time?" Mary-Sue dropped her jaw. "Another one?" "Yup. Chili girl! He was hanging out in the yard with her flirting and hugging her. I about died. Not that I was surprised, but his blatant flaunting just threw me for a loop." "So what did you do?" Mary-Sue asked. "I almost laughed in his face, but then I just decided to give him back his ring and get out of there. And then he started yelling, 'I don't like airplanes!'" Cassandra laughed. "Don't ask me, I have no idea WHAT that was about! She continued, "But anyway, it just got me thinking that I never really loved him. I liked his attention, and his smooth talk, and I think I just got swept away. "I just smiled at him, mostly out of pity, I think. He's going to be an awfully lonely old man someday if he can't quit running around with flings everywhere. 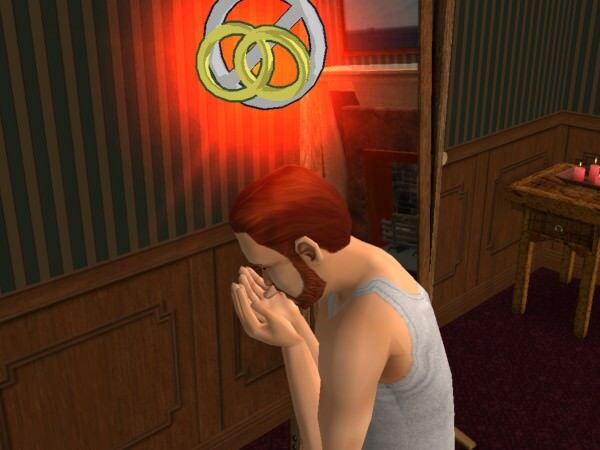 I'm sure he only proposed to me because of Daddy's simoleons. I don't care about it, but Don does." Mary-Sue shook her head. "You're well rid of him. How many women does that make that he's hooked up with?" Cassandra said, "Including me, just three that I know of--but I seriously can't believe it about the sisters! I wonder if they know about each other with Don?" "I don't think I'd want to be in the room when one of them finds out!" Mary-Sue exclaimed. â€œSo, you ready to go home now?" Cassandra jumped, "Oh wait! I forgot to tell you the best part! Darren came over last night!" Mary-Sue clarified, "Darren Dreamer? Your friend? The one whose wife died?" "Yes, that's him, his son is named Dirk. Sweet kid. I think he's got a girlfriend, but I don't know who it is. "But anyway, Darren just showed up last night, right after Don and Dina left!" "I was so glad to see him! He's been such a friend since my Mom disappeared. Really supportive. Even though he's been so down since his wife died, he's still made an effort to be a good friend." 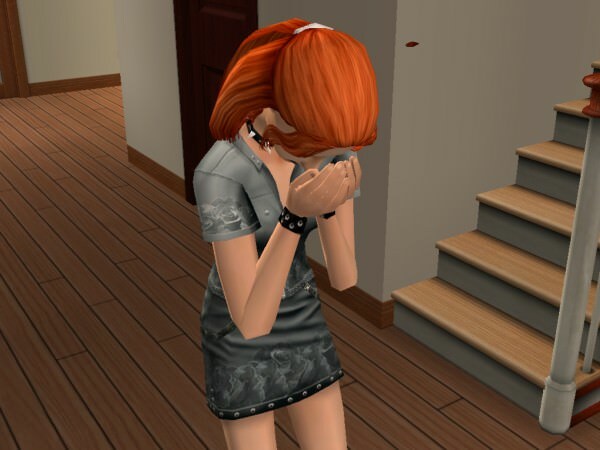 "He was so sweet--just said he'd been thinking about me and wanted to see if I was okay, and then he took my hands and told me if I ever needed anything that he'd be there." "And Mares, suddenly I realized he's in love with me! I guess I just hadn't ever looked at him that way because I'd been busy with Don, and I thought he was just a sweet friend, but it's more than that. "And I think I feel the same way! With him I feel such a warm and comfortable feeling. Not like with Don, always lusty and wild, but no caring, really--this felt so right." Mary-Sue gasped. "Really? That's amazing? I only know him a little, but he seems awfully sweet. And such a good Dad to his son since his wife died. Are you sure you love him?" 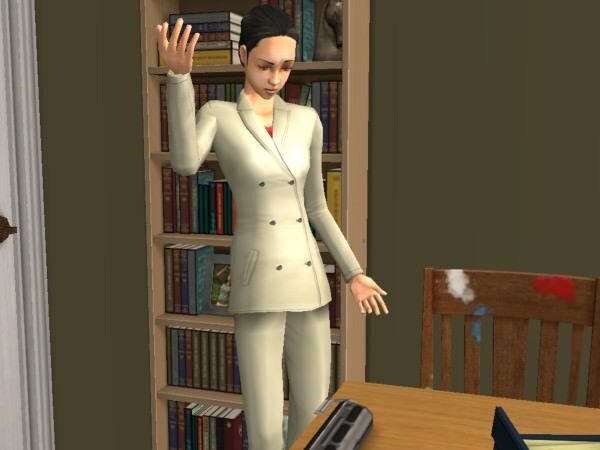 "So now I need to figure out what to do about it," Cassandra continued. "Ever since last night I have a feeling of a very strong want to become engaged to him. It's so compelling! But I don't want to move too fast like I did with Don." Cassandra glanced to her right and then nudged Mary-Sue. "Isn't that the guy that was talking to you before? He's cute! You should go talk to him." 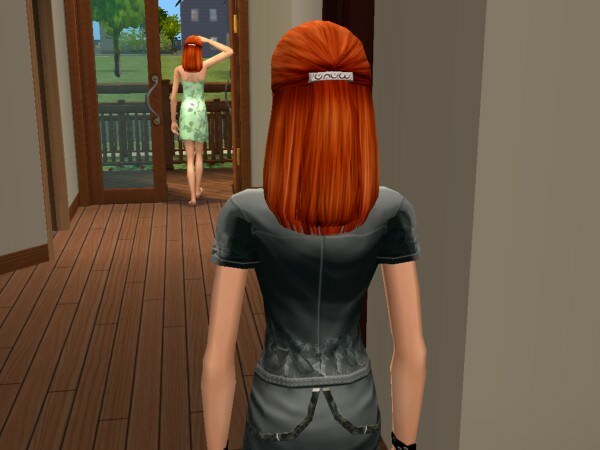 Mary-Sue got up hesitantly and wandered casually over to where Cyd was sitting, trying to look like she was just interested in checking out the railing. But Cyd popped up immediately when he noticed her and seemed glad to see her and began talking animatedly about his hobbies. Mary-Sue responded by telling him how much music meant to her. She was a little flustered by his beautiful green eyes, and hoped she wasn't boring him, but he seemed sincerely interested in what she was saying. Well, she thought. You never know. 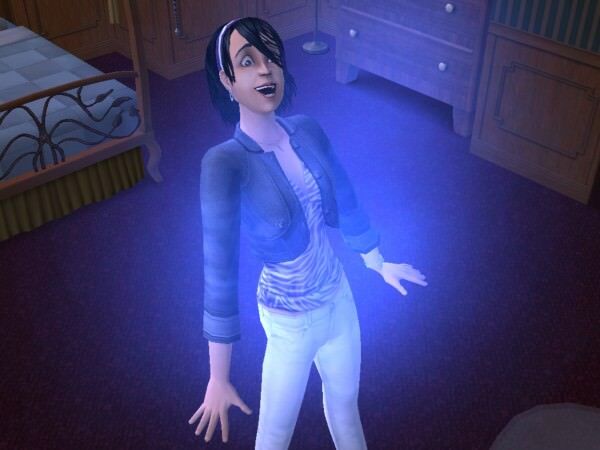 When Mary-Sue brought Cassandra back to her house, she showed her into the bedroom. Mary-Sue chose a new bed that reflected her tastes. "Ta Da! I hated Daniel's style. So clunky." "That's a start," said Mary-Sue, "And then I am going to redo the whole downstairs. 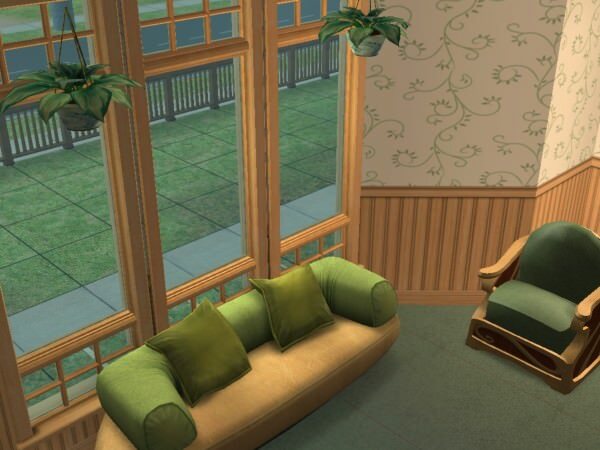 If I sell all of Daniel's ugly heavy furniture I should have enough simoleons to get some new things. 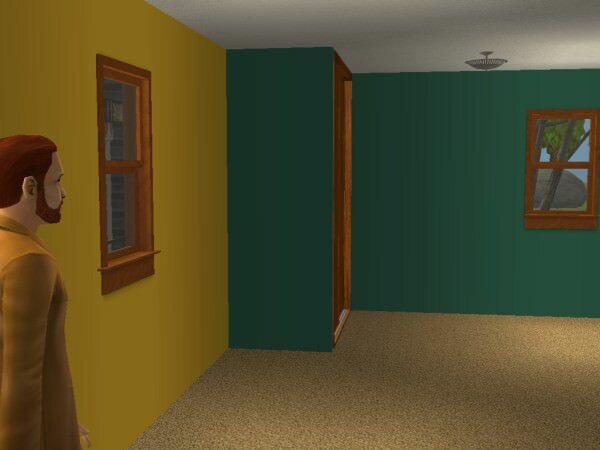 And redo the carpet and stuff. Daniel liked it dark. "Oh, but didn't you say before that you had something you wanted to give me?" Cassandra handed over her gift and explained, "You've got the new look--now THIS will change you on the inside, too, and LITERALLY make you younger. I've used it several times when I've felt time rushing by too fast." She winked. "And this will make you closer in age to Cyd, too." "Aha!" said Mary-Sue. "So THAT'S why you are so much younger even though we grew up together!" 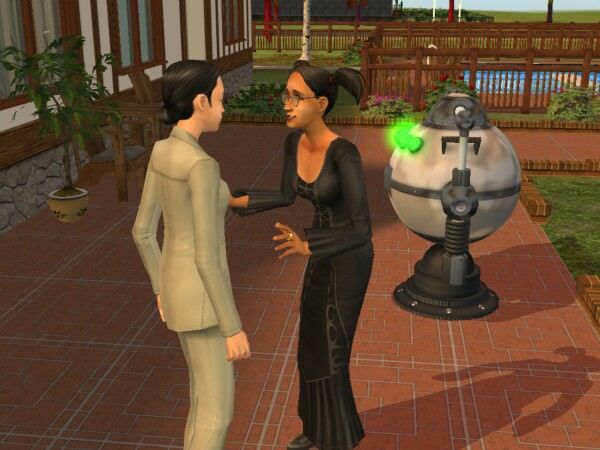 Cassandra left after making plans to meet again soon, and Mary-Sue regarded the odd liquid cooler she'd been given. "What have I got to lose?" she thought, and started drinking the viscous green sludge. It was amazing! She could feel her years rolling backwards. 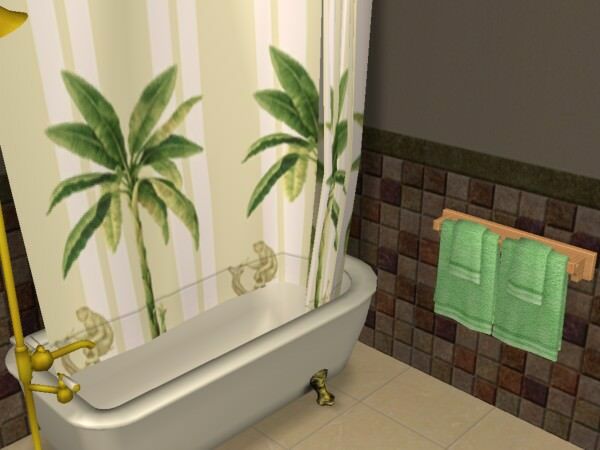 "I was going to wait to redo the house, but this gives me the energy to start right now!" Mary-Sue got rid of all the dark and ponderous things that Daniel had preferred for the house and chose items that were light and cheerful. 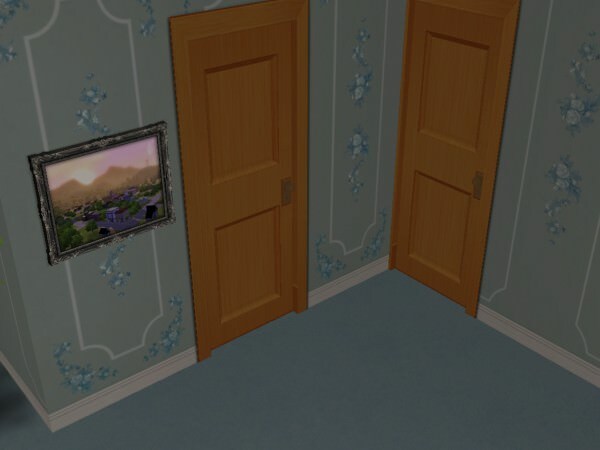 The bedroom was done, now on to the bathroom! 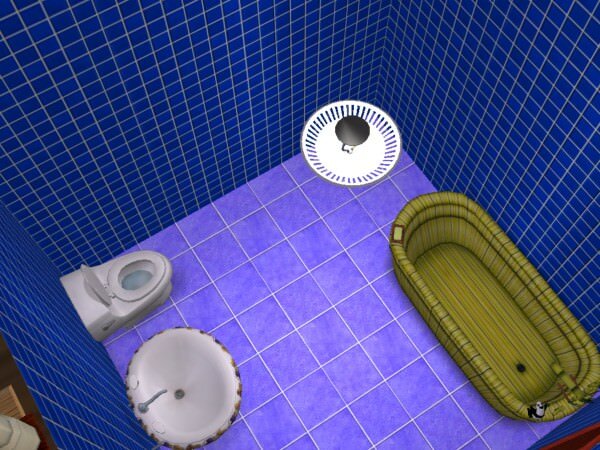 Mary-Sue especially wanted to get rid of the weird tub Daniel had bought. It had always made her feel like she was bathing in a horse trough. Not to mention that the clashing blue tiles made her feel like she was drowning. She was pleased with the result. Next she tackled the living room. Finally tired after her long and busy day, she sat and thought about everything that had happened. The pain of divorcing Daniel was still sharp, but she felt like new opportunities were presenting themselves and that she had the strength to carry on. And she smiled as she looked at the one thing that would never let her down. Last edited by grumpy_otter : 27th Nov 2018 at 11:52 PM. lol--I wanted to have some time to tell her story! Keep them BFF's. A good friend is worth their weight in gold, plus romantic attachments can end ugly. As friends, they can tell each other their 'stories' and support each other through the good and bad. That's just what I had in mind--and I thought Cassandra's "heart" would show where her romantic interests lie.